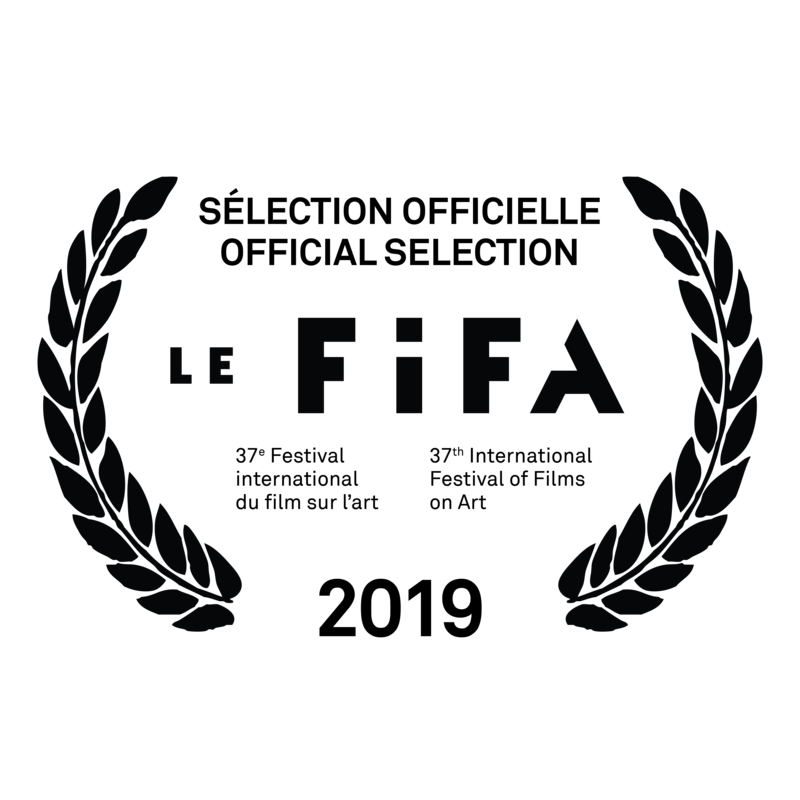 The film “LE LEGS” will have its world premiere screening at Montreal’s 37th edition of the International Festival of Films on Art (FIFA). 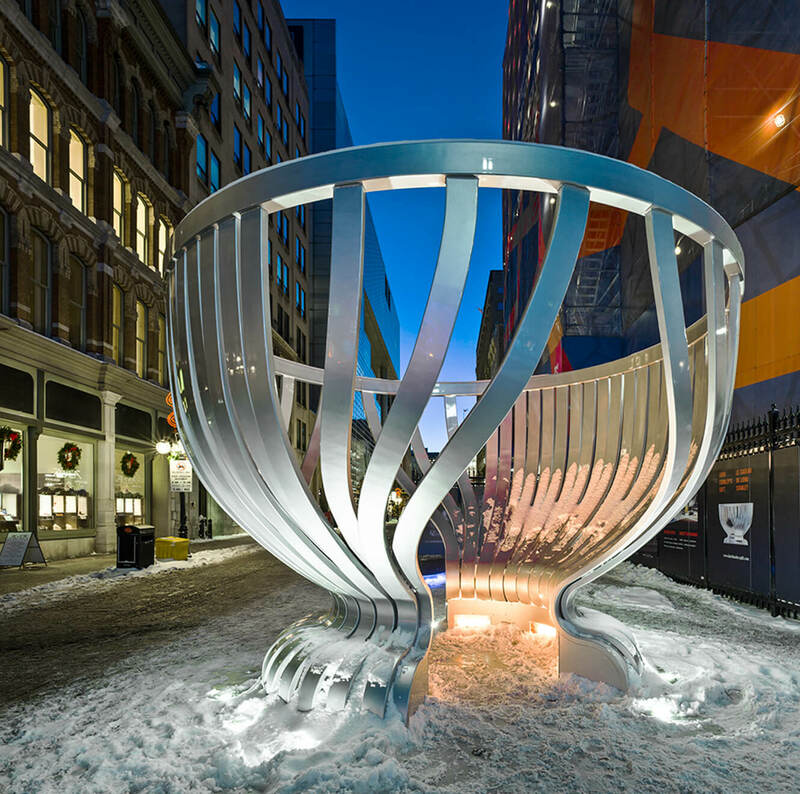 The film on Lord Stanley’s Gift Monument (Ottawa) by Covit / Nguyen / NORR features captivating images of this artwork-monument in the public square, accompanied by commentary by the artist Linda Covit and two professionals from the art milieu. Context, design and historical relevance are explored in this powerful commemoration of one of Canada’s most cherished national emblems. 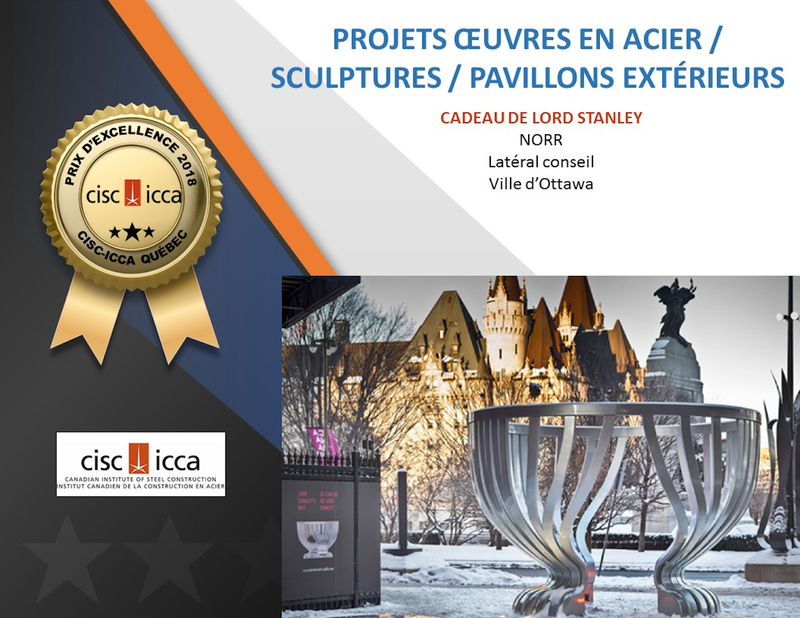 Lord Stanley’s Gift Monument (Ottawa) is nominated for a 2018 Quebec Steel Design Award of Excellence, CISC (Canadian Institute of Steel Construction) in the category Works in steel / Sculpture / Outdoor pavillons. 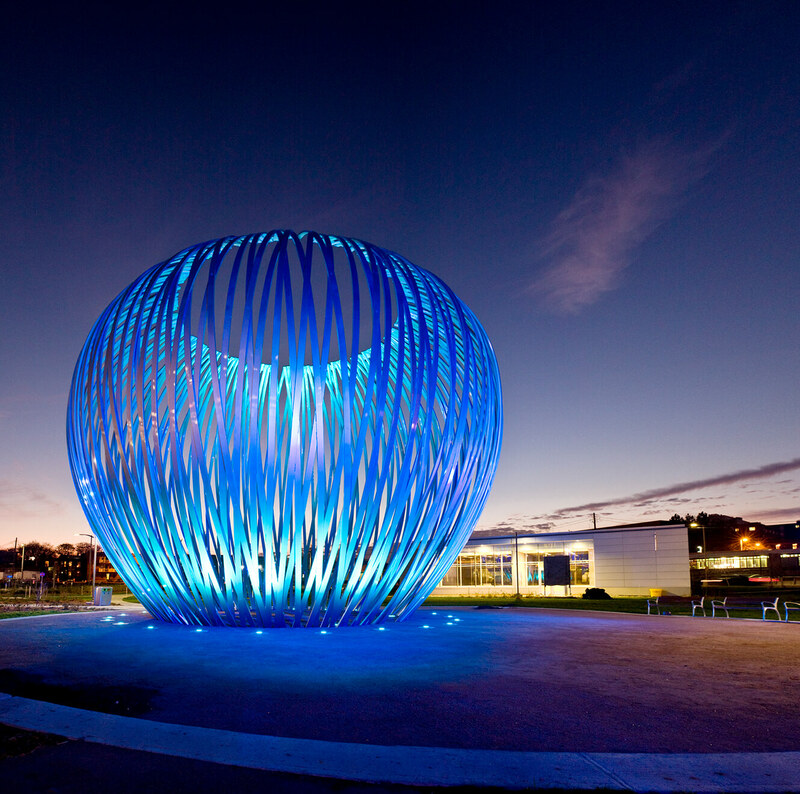 Raindrops, a sculptural installation for the Hôpital Maisonneuve-Rosemont, Montreal, is currently in fabrication. Installation planned for spring 2019. 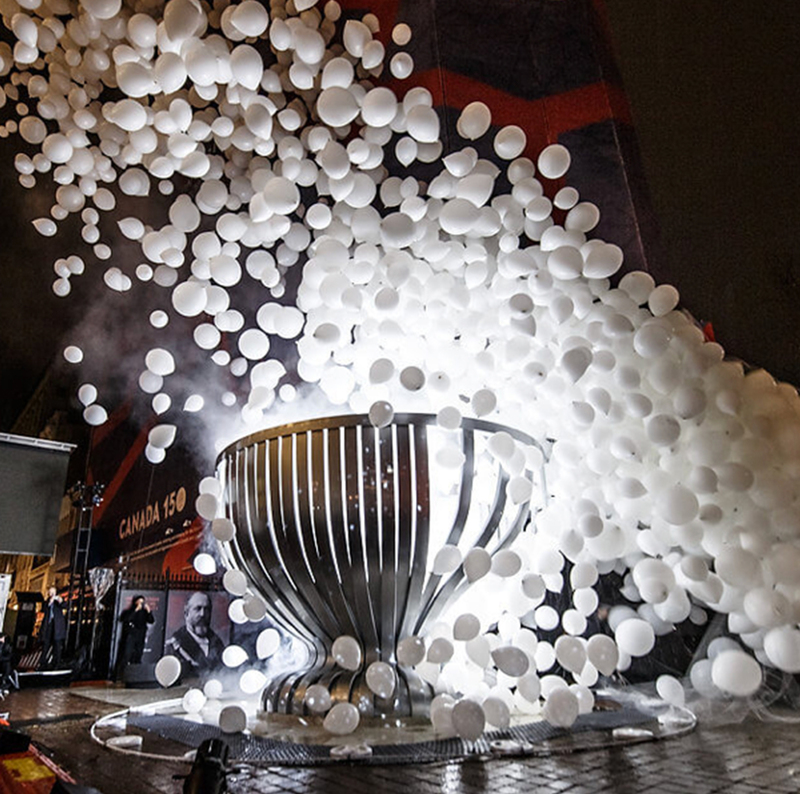 Lord Stanley’s Gift Monument was unveiled with the release of hundreds of balloons October 28, 2017, at the corner of Sparks and Elgin in downtown Ottawa (Canada). Linda Covit lives and works in Montreal, Canada. After graduating with a B.Sc. 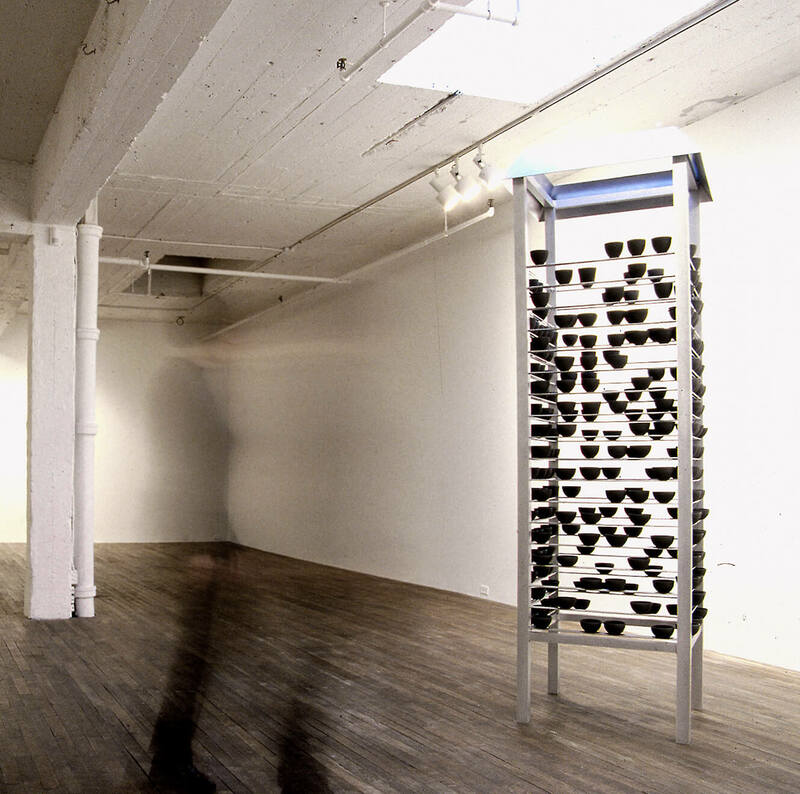 from McGill University she became involved with Powerhouse Gallery, Montreal while developing her sculptural practice. Numerous trips to Japan photographing temples, gardens and contemporary architecture have been influential. 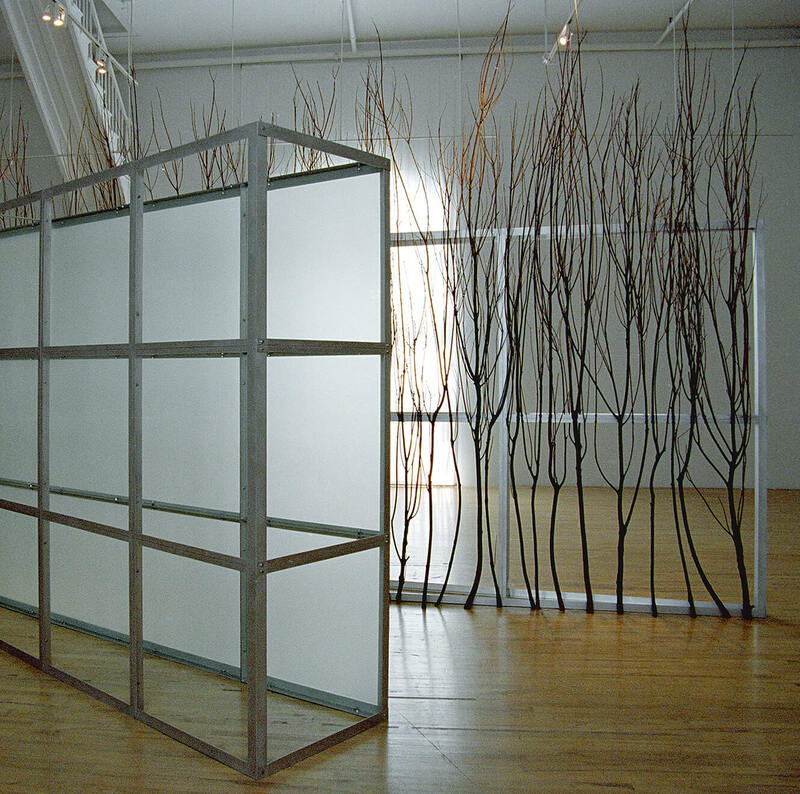 Solo exhibitions include Plein sud, Centre d’exposition en art actuel à Longueuil; Expression, Centre d’exposition de Saint-Hyacinthe; le Musée de la Ville de Lachine; Musée national des beaux-arts du Québec; Toronto’s Koffler Gallery and Genereux Grunwald Gallery; the Canadian Embassy, Tokyo, Japan. She participated in group exhibitions in Japan’s Echigo-Tsumari Art Triennial 2003, the 53rd Museo internazionale delle ceramiche in Faenze, Italy, and Wave Hill N.Y. 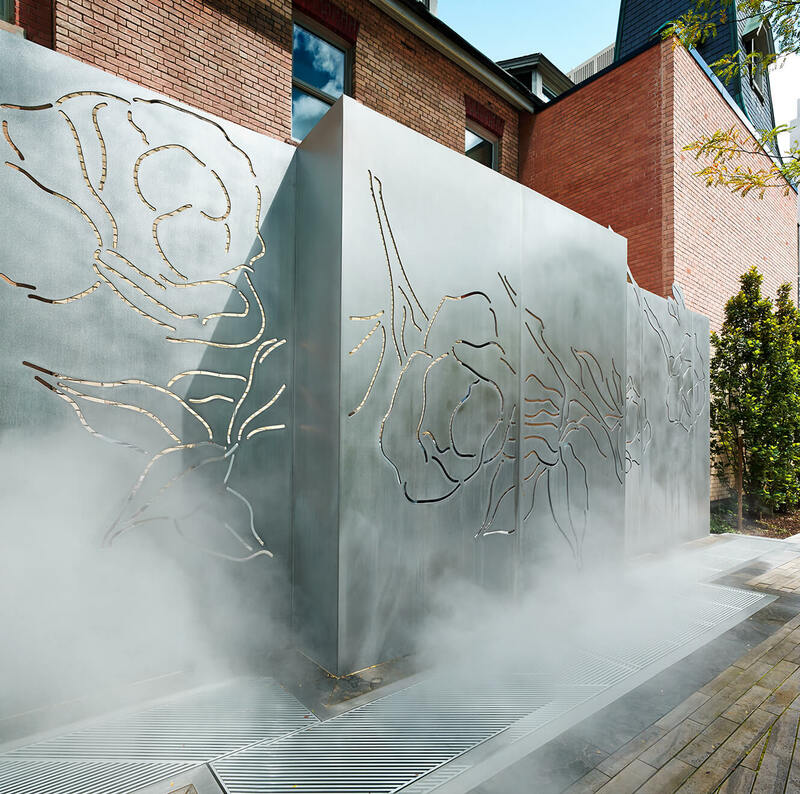 Among her many public artworks are a gift from the Quebec government to Shandong Province, China; an installation on Montreal’s Mount Royal Park commemorating the 1969 Lennon-Ono bed-in, (Les Arts et la Ville Prix Aménagement 2012; CSLA Regional Merit Award 2012), an art wall with mist at Toronto’s Four Seasons Hotel and Residences (Toronto Urban Design Awards : Award of Merit 2015; CSLA Regional Merit Award 2014); four garden rooms in the Shangri La Botanical Gardens and Nature Center, Orange, Texas (ASLA Honor Award, 2012). 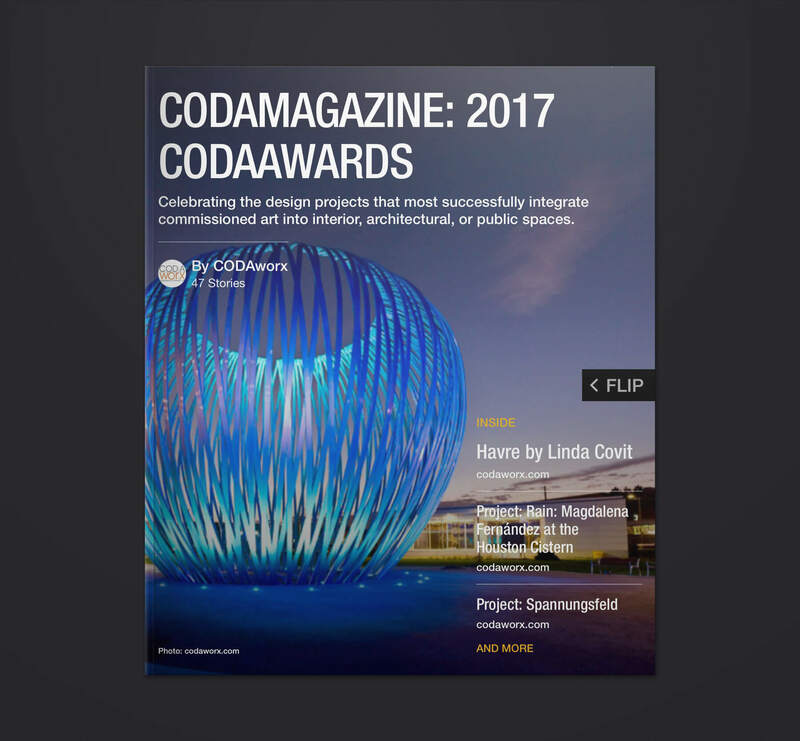 Her monumental sculpture for the MUHC was the CodaAwards 2017 winner in the healthcare category. 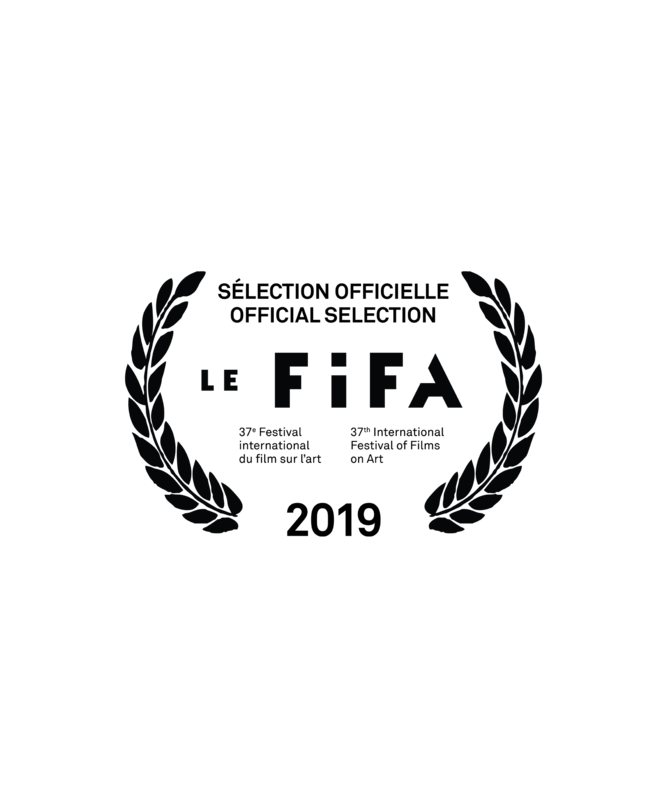 Covit has received numerous grants from the Canada Council, the Japan-Canada Fund, the Conseil des arts et des lettres du Québec, the Cirque du Soleil and New York’s Pollock-Krasner Foundation. Her works figure in the collections of the Musée d‘art contemporain Montréal, the Musée national des beaux-arts du Québec, the Collection Maurice A. Forget, the Cirque du Soleil, the Musée de Lachine, the Koffler Gallery, and the University of Concordia. 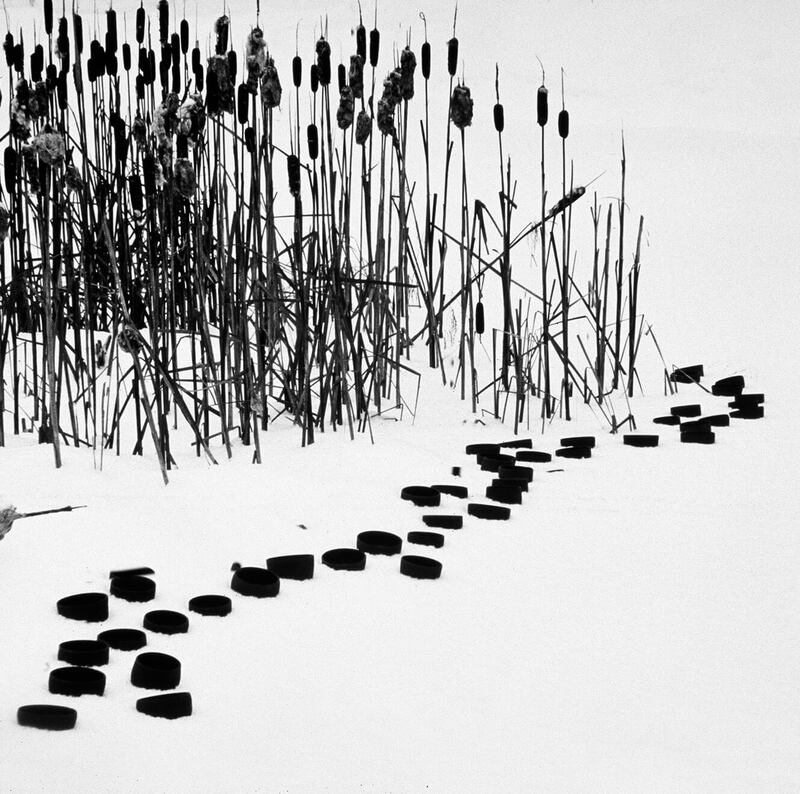 A monograph of her work was published spring 2014 by Plein sud. Creating large-scale installations for the public space is central to my art practice. My approach follows investigations into the overlapping areas of art, landscape art and architecture. My concepts are elaborated through research closely linked to specific projects. I enjoy the process of collaborating with professionals from complementary fields and have found this to expand the creative process through an exchange of ideas and approaches from differing backgrounds. My interest is in the development of site responsive work that lies in the challenge of rendering a site with new meaning or heightening what is already there; in creating a gesture that transforms a public space into a personal experience; in creating a work that instils a sense of place. Scale, acknowledgement of the viewer, a harmonious relationship of the built with the natural are some of my concerns. 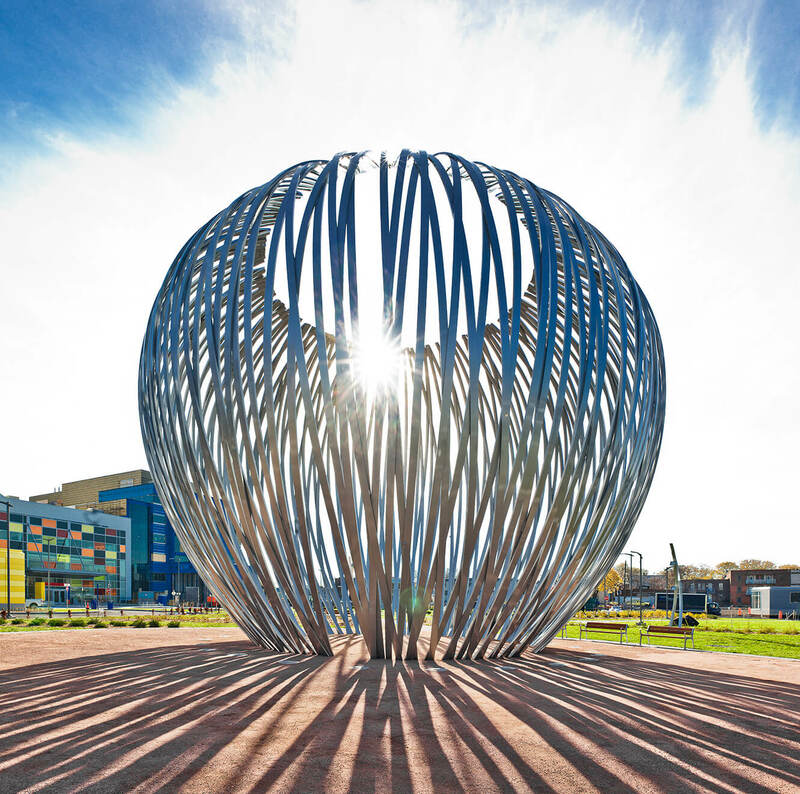 This sculptural installation takes a contemporary approach to the concept of monument. 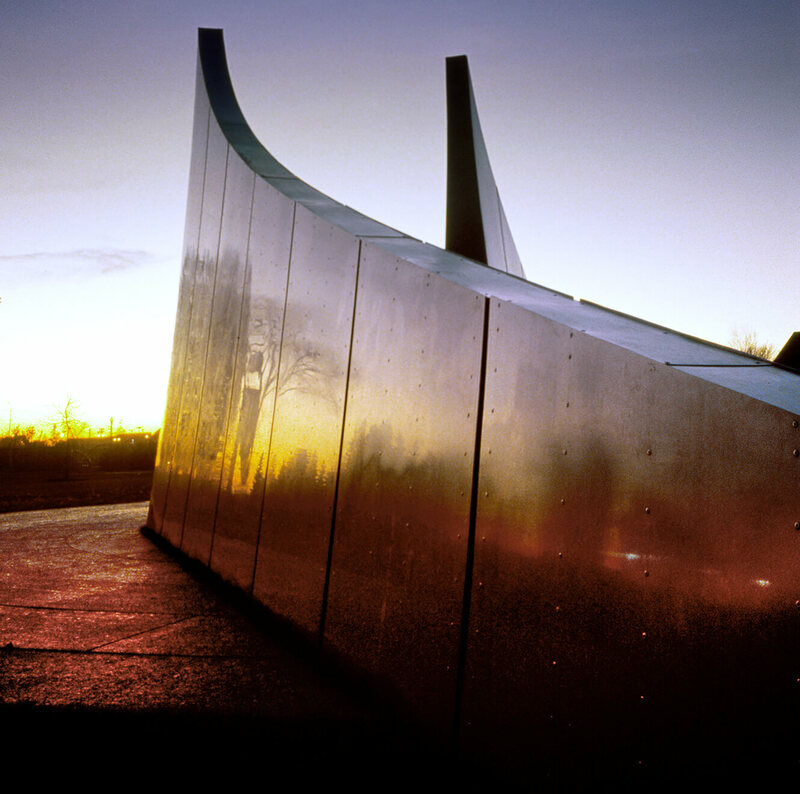 Rather than a traditional structure to be looked at and contemplated, it invites the visitor into the monument to share an important part of the Canadian identity and culture. 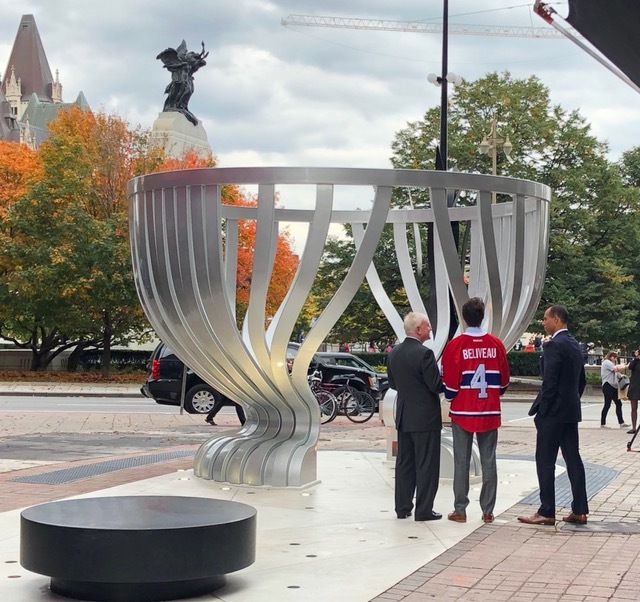 A large chaliced form evokes the original Dominion Hockey Challenge Cup gifted by Lord Stanley in Ottawa on March 18, 1892 and the current Stanley Cup as it came to be known. 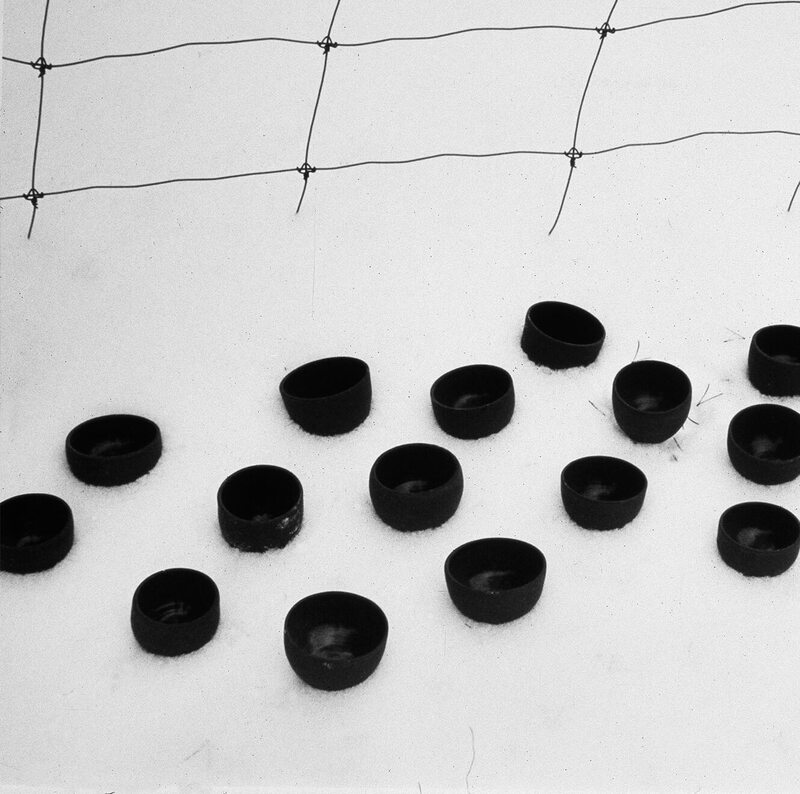 It is the very essence of this cup – a trophy that speaks of hockey and of the passion it incites in its scores of fans, a repository of names and dates documenting each series’ win – that informs the sculptural installation. A thick round of polished matte black granite, across from the Cup, alludes to a hockey puck and offers seating. Inspired by the hockey rink, the ground surface is poured in place white cement . Thin stainless steel lines crisscross the white ground suggesting skate marks on ice. Thirty-six black granite discs are scattered across the rink, embedded flush in the ground. Each is engraved with the name of a hockey team that made it to the Finals : 16 are matte finish, representing the Challenge Cup era (1893 – 1915); 20 are mirror finished, representing the NHL era from 1915 to 2017. A website details each team that reached the finals, the number of times and years, the history of the original gift and of Lord Stanley, plus other relevant information. 304,8 cm x 445 cm x 1000 cm / 10’ x 14’7" x 32’9"
The McGill University Health Centre (MUHC ) is one of the world’s foremost academic health centres. The new hospital opened in April 2015 at the Glen site, a redevelopment project that created leading-edge facilities in three sites. 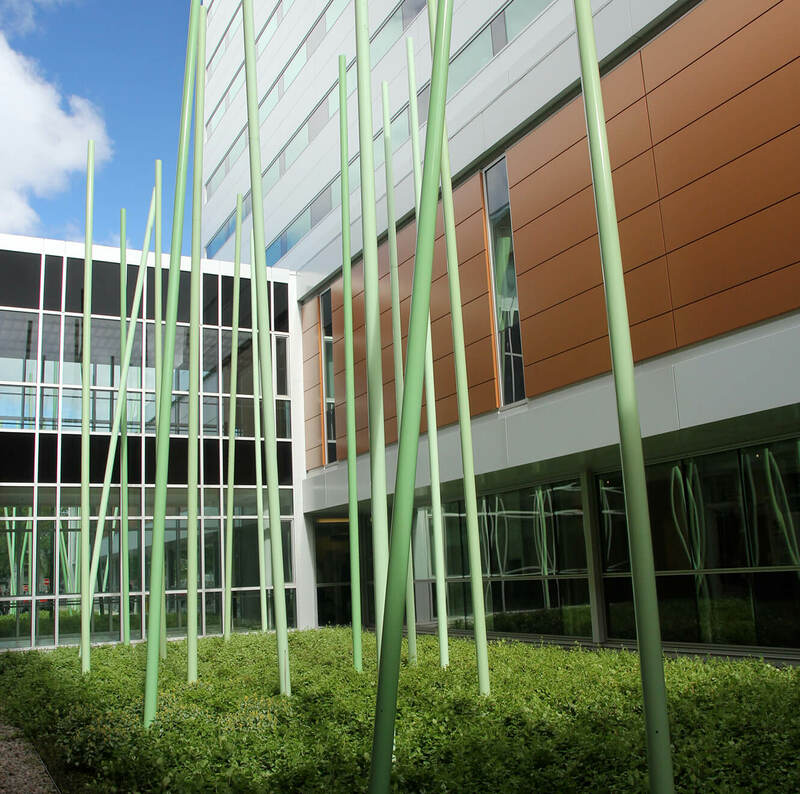 Havre was completed in November 2014, the largest of eleven public art commissions spread throughout the new MUHC hospital complex. 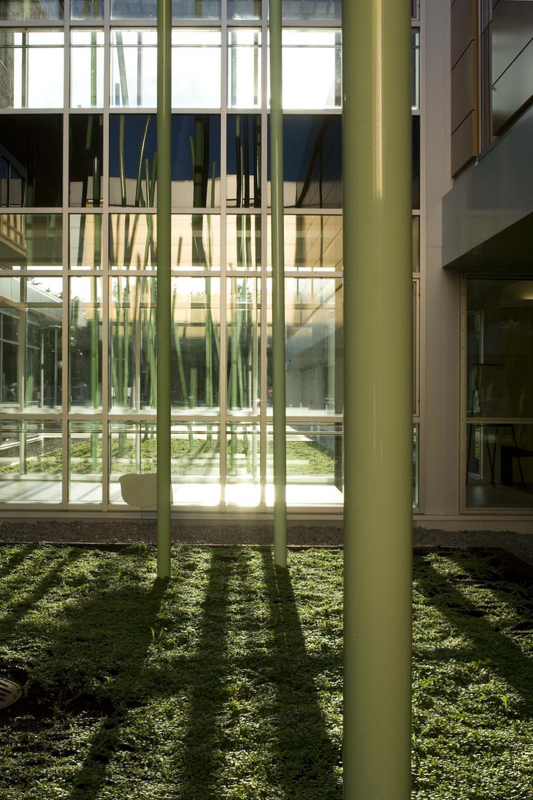 Sited on the entranceway grounds the objectives included being highly visible to road traffic and to commuters in the nearby trains, drawing people into the landscaped site with its many public gardens, and becoming an iconic symbol for the hospital. While scaled to the immensity of the site Havre also retains a more intimate experience. 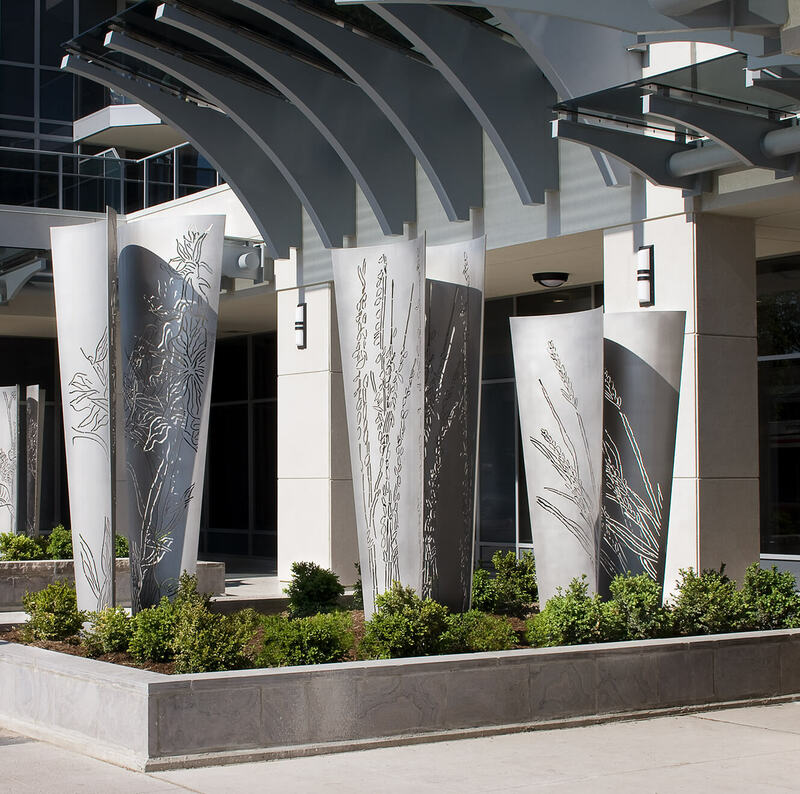 Conveyed as a “sculptural embrace” it welcomes patients, visitors, staff and passers-by into the artwork through three “doors’, offering a personal experience. Thousands of perforations compose an image of a flower in each cone. Referencing spy apple blossoms, they speak of the fruit that once grew in nearby orchards. Changing tones of white light illuminate the cones during evening hours. Two cones are sited on a busy city street fronting a condominium tower ; a third cone is sited at the corner, a junction of two streets. 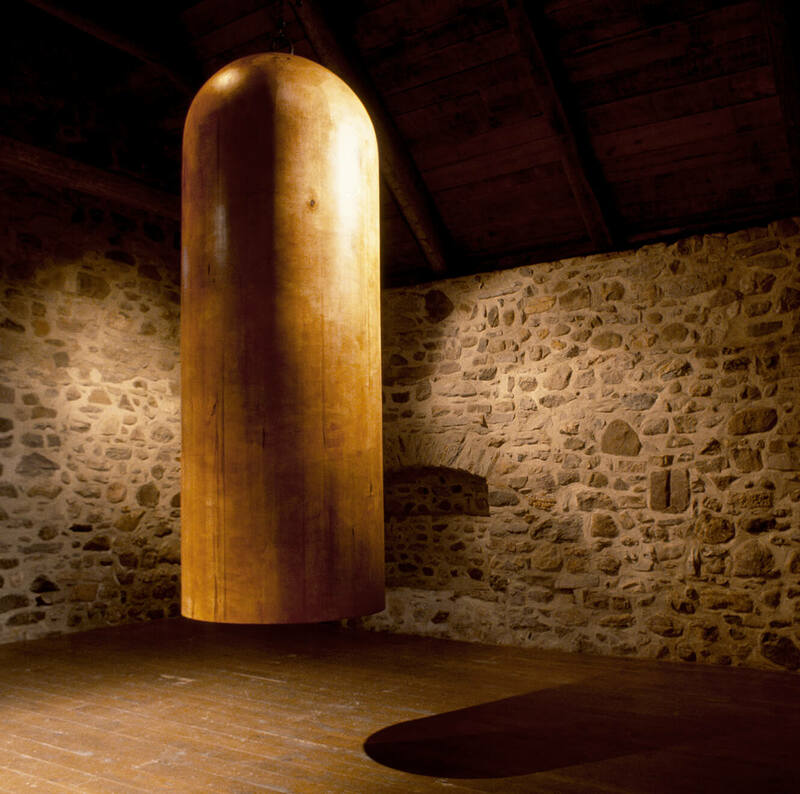 The conical-shaped sculpture, its dimensions developed in proportion to the gallery space, rises to a few inches from the ceiling and extends towards the two lateral walls of the room. Its outer shell is formed of long, thick planks of torrefied wood, fixed vertically to a metal frame. Interior light seeps through narrow slits between the planks, and spreads through the top opening of the structure. 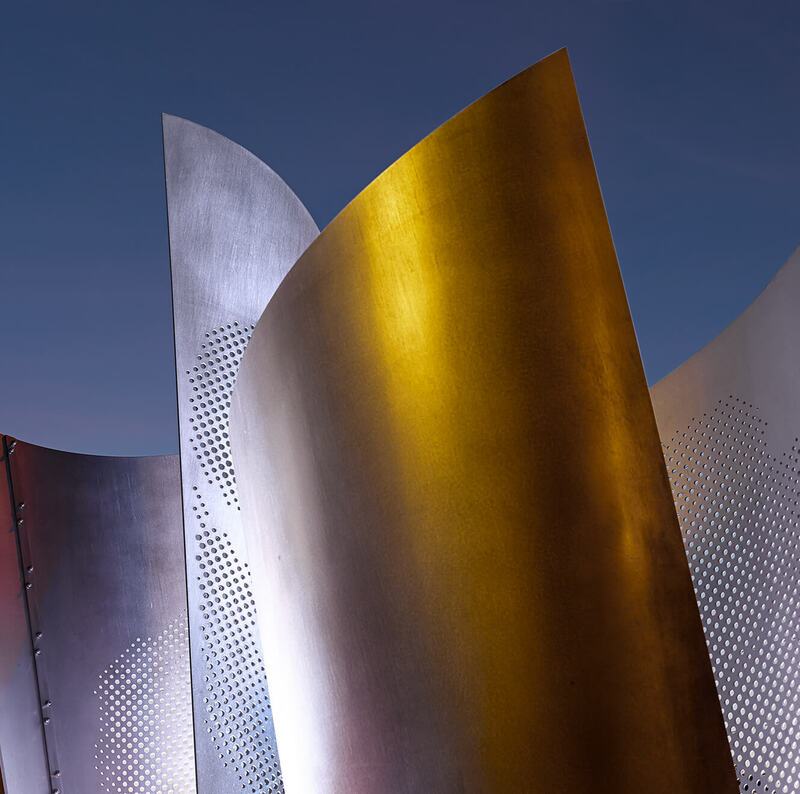 The stainless steel sculptural wall defines the edge of the Four Seasons Hotel and Residences’ garden. Climbing roses, a favorite flower in the Victorian era references the neighbourhood’s Victorian buildings and heritage. 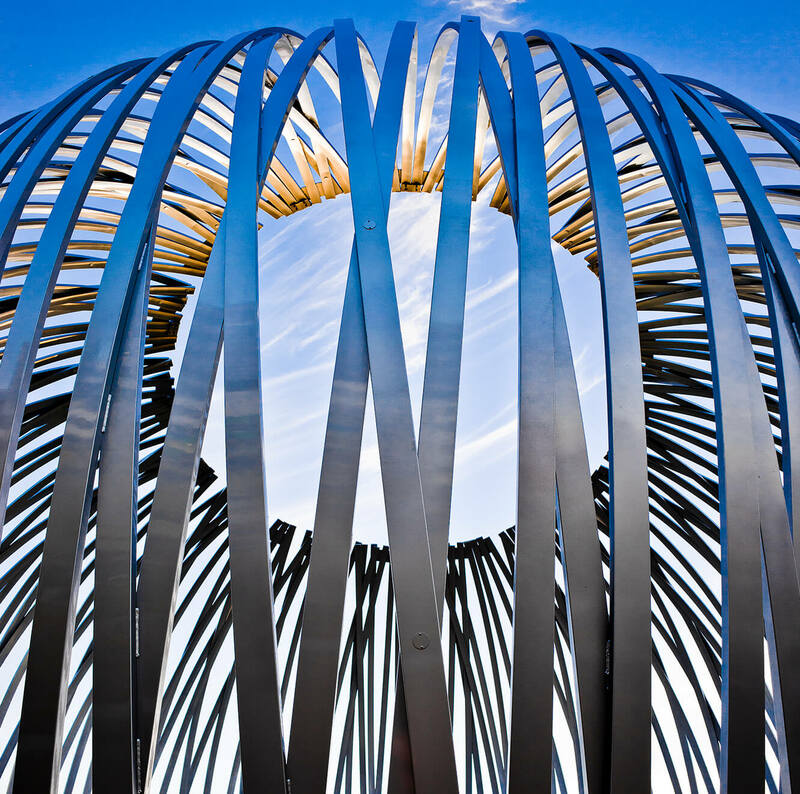 Translucent clouds of mist emerge from the anodized aluminum grating along the wall’s base. Slowly changing tones of white bathe the wall at night. A gift from the Government of Quebec to the province of Shandong. Jinan, its capital, is one of China’s most famous historical and cultural cities. It is renown for its 72 natural springs, and for the weeping willows that grow along the shores of the lakes they feed. 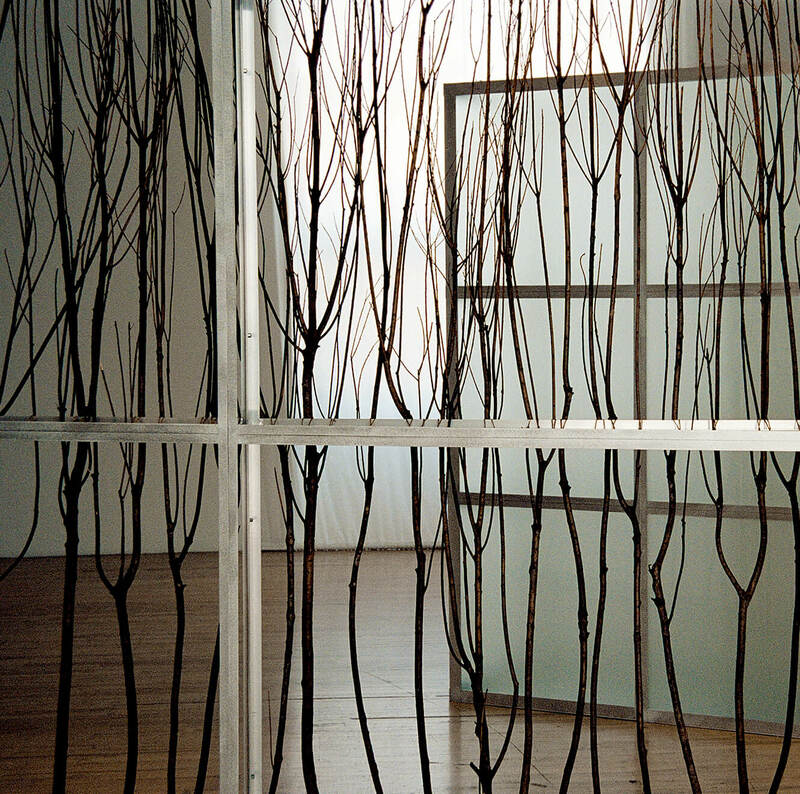 The large drawings of branches – the curly willow closely associated with Shandong, the pine tree, a familiar emblem of Quebec’s northern landscape – are references both historical and contemporary, affirming a sense of place. The park is an important heritage site in the heart of the city, its layout originally conceived by Frederick Law Olmsted. 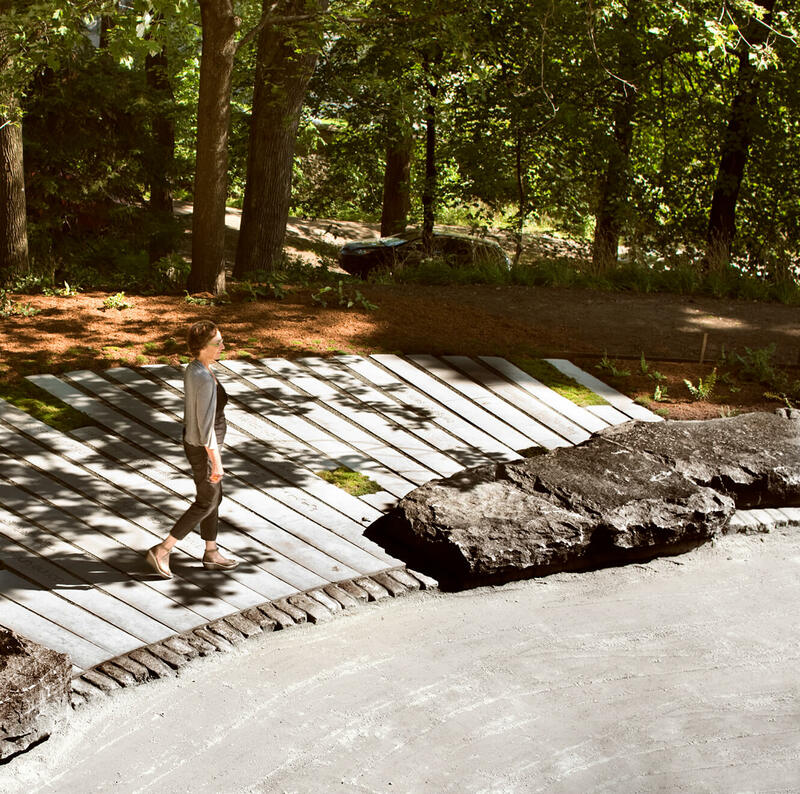 The artistic intervention commemorates the 1969 John Lennon- Yoko Ono bed-in here; marks the transition between city and park and the relationship between natural and built elements; references the historic forest and Olmsted’s vision; and creates a space that invites contemplation. The site borders a hairpin turn in the winding path up the mountain’s southern flank. 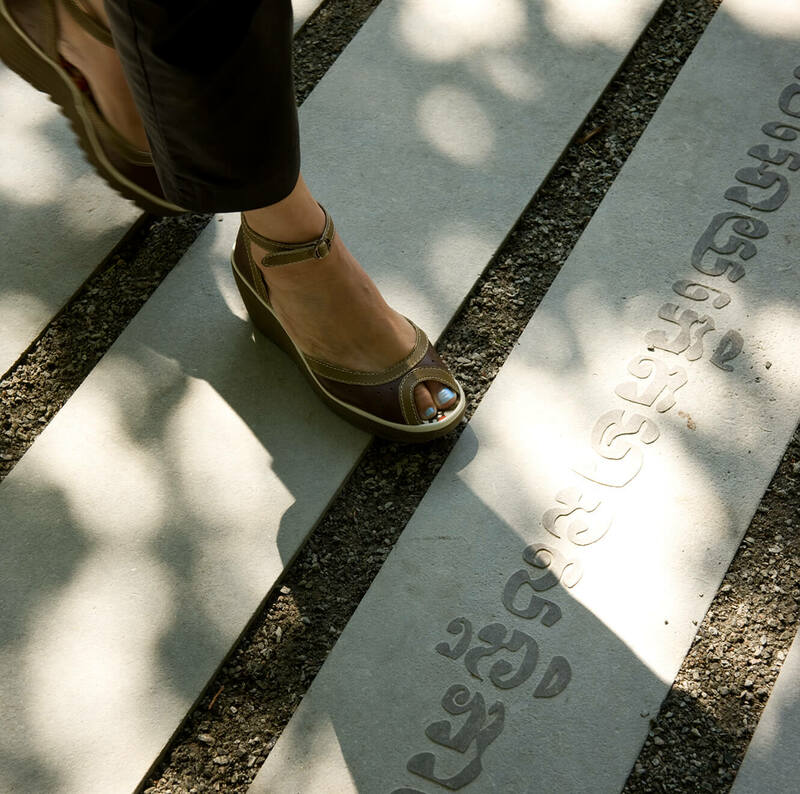 The phrase give peace a chance, from the song written during that event, is carved in relief on stone slabs in forty languages spoken in this city. Rough stone blocks mark the installation entranceway, provide seating and reference the stone of the mountain. Moss and ferns complete the work. 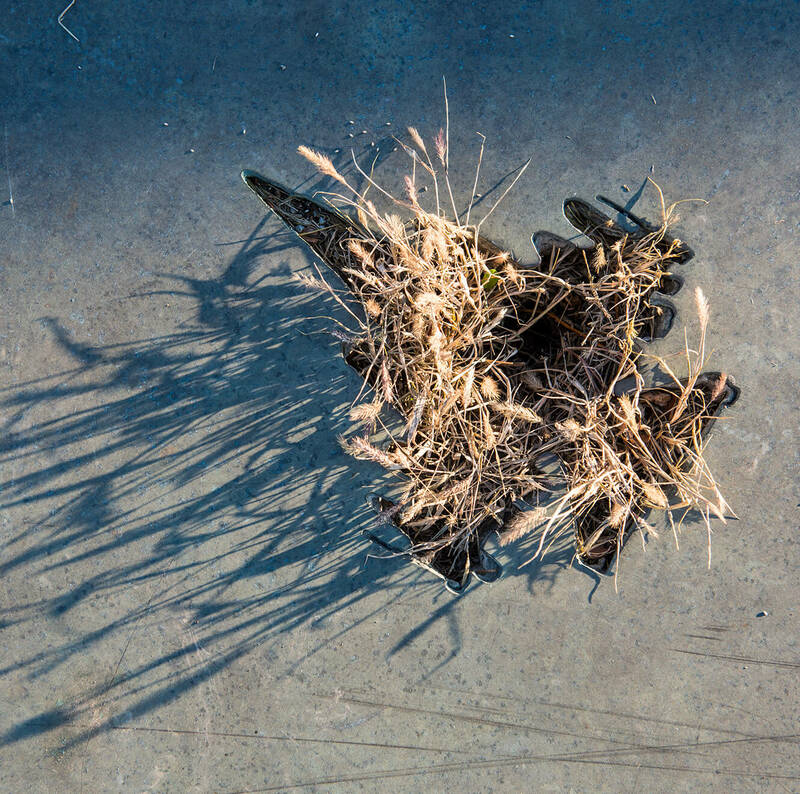 100 x 1700 x 600 cm / 3'3" x 56' x 19'8"
The sculptural installation references the history of the site as evoked by tracings of wildflowers: the flora that likely grew here at the time of its settlement in what was a pioneer community. Fela Grunwald Fine Arts, Brad Golden + Co. 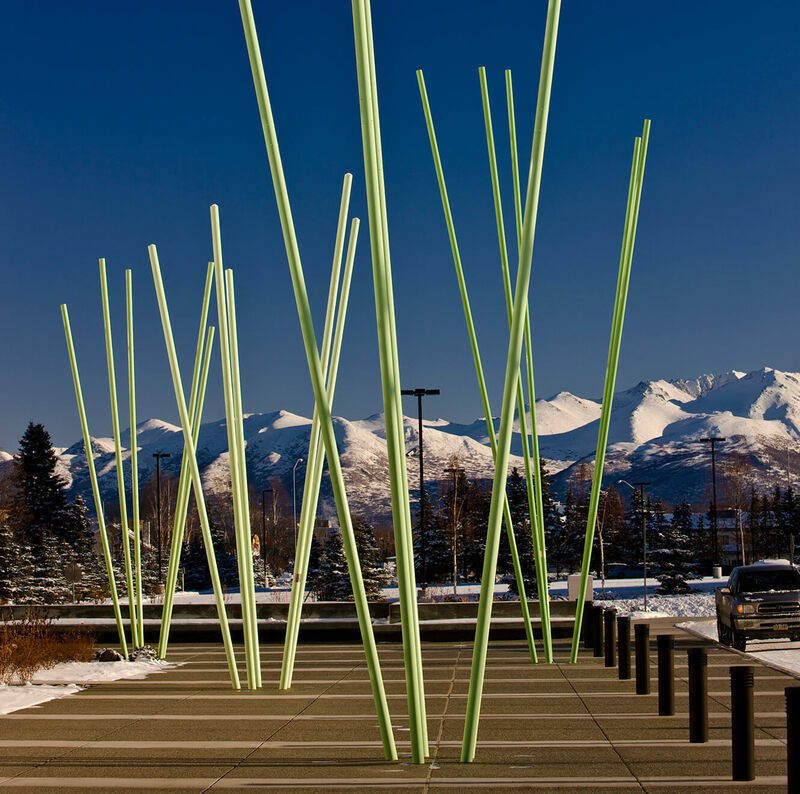 The installation forms an outline of jagged peaks, recalling the profile of the Chugach mountain range surrounding the city. 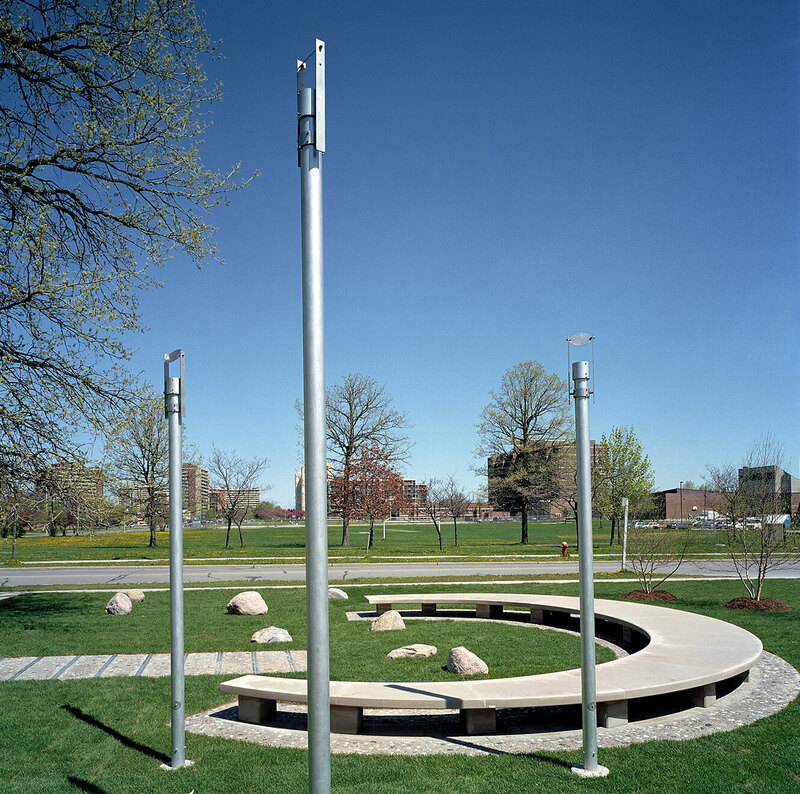 The tallest pole in each group is encircled with a number cut out of stainless steel, referencing the elevation of one of the range’s peaks. The 252-acre Center includes historic and contemporary gardens, boardwalks over wetlands, a bird blind, boating excursions and outdoor classrooms. The Center’s predominant aim is the exploration of each person’s role in the stewardship of nature; it serves primarily as an education facility for local residents as well as visiting tourists. 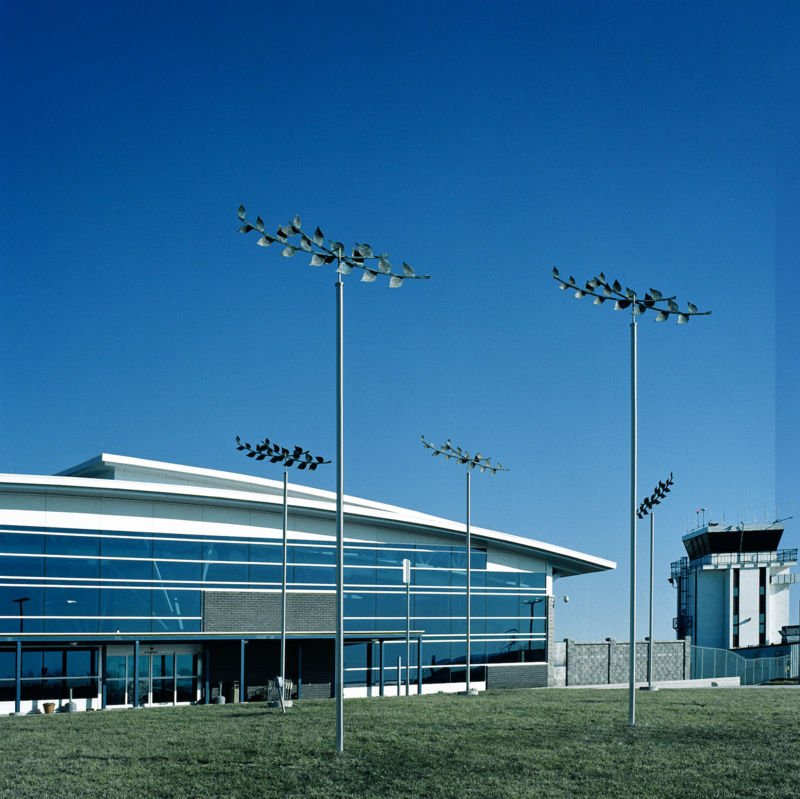 Opened to the public in spring 2008, it is certified LEED Platinum. 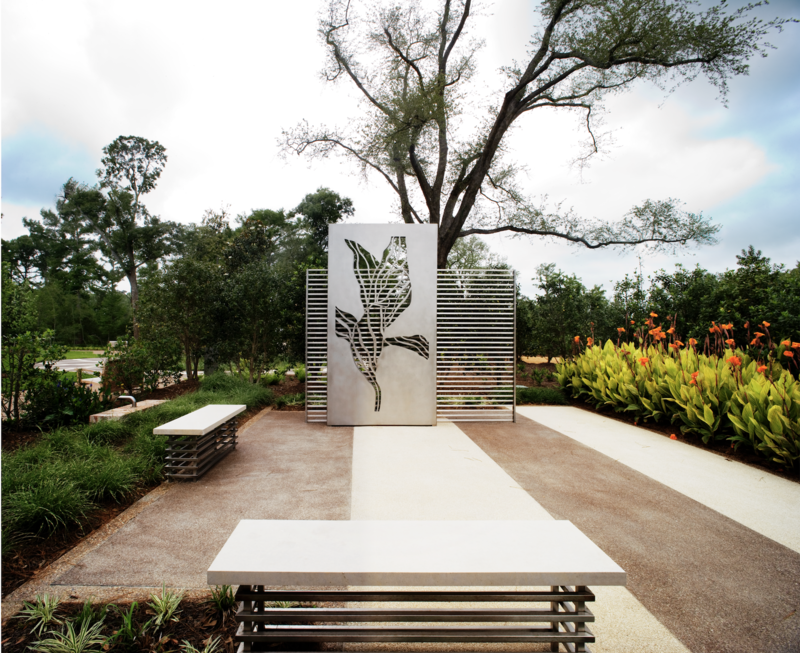 Working in close collaboration with Louisiana landscape architect Jeffrey Carbo, FASLA, site responsive sculptural installations were incorporated into four garden rooms, resulting in a seamless integration of art and nature. Inspired by forms found in plants the installations are designed to engage both their “rooms” and visitors, offering a unique experience of space and place. 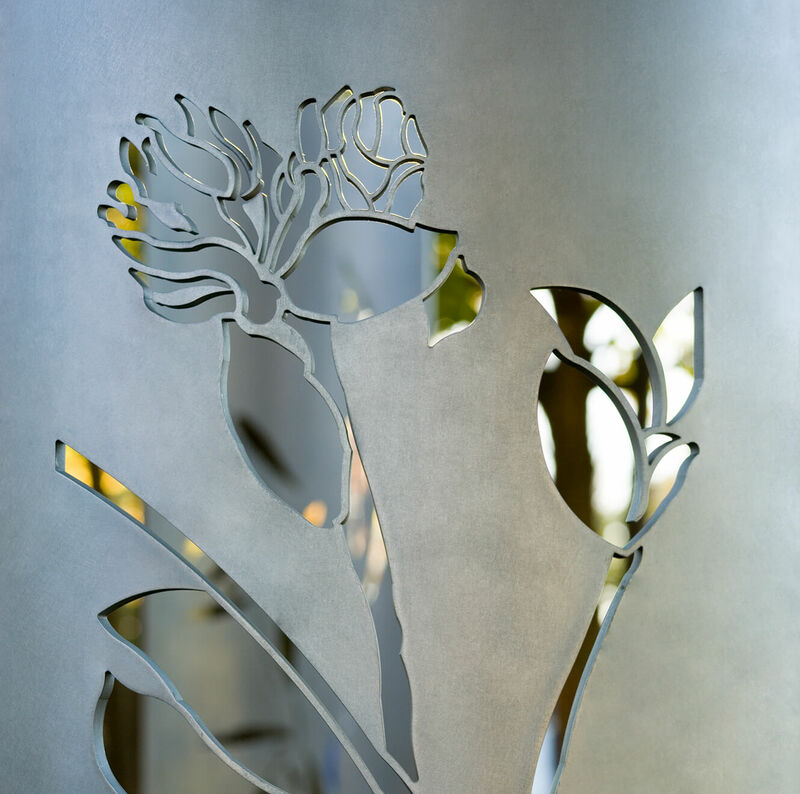 In each room, a drawing of a plant detail, cut out of two layers of stainless steel plate, references one of the plants within its site. 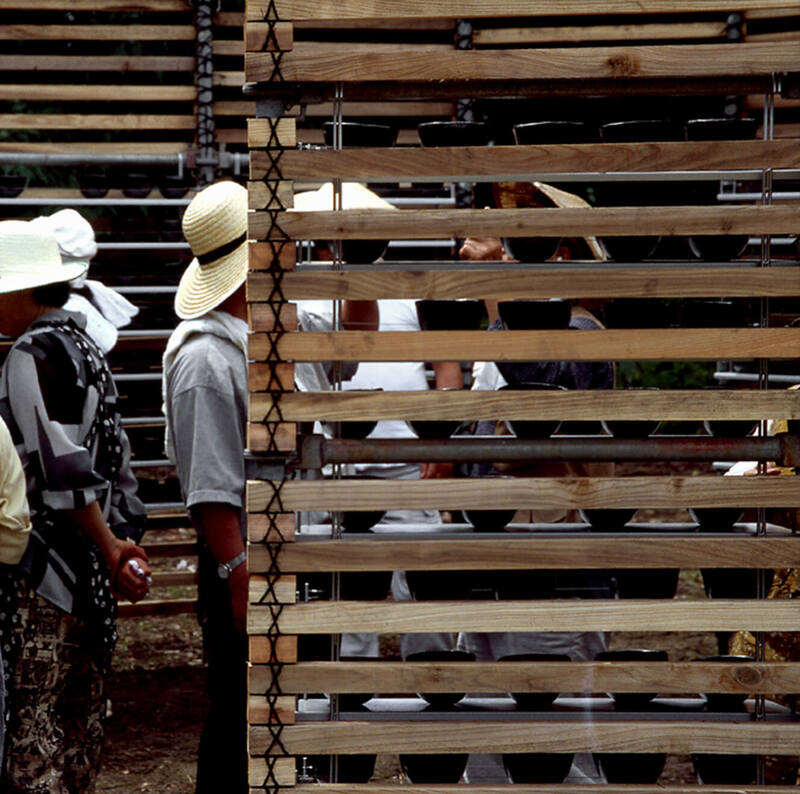 Benches and screens complete the work, the latter offering students a canvas on which to attach related natural materials in creative ways. 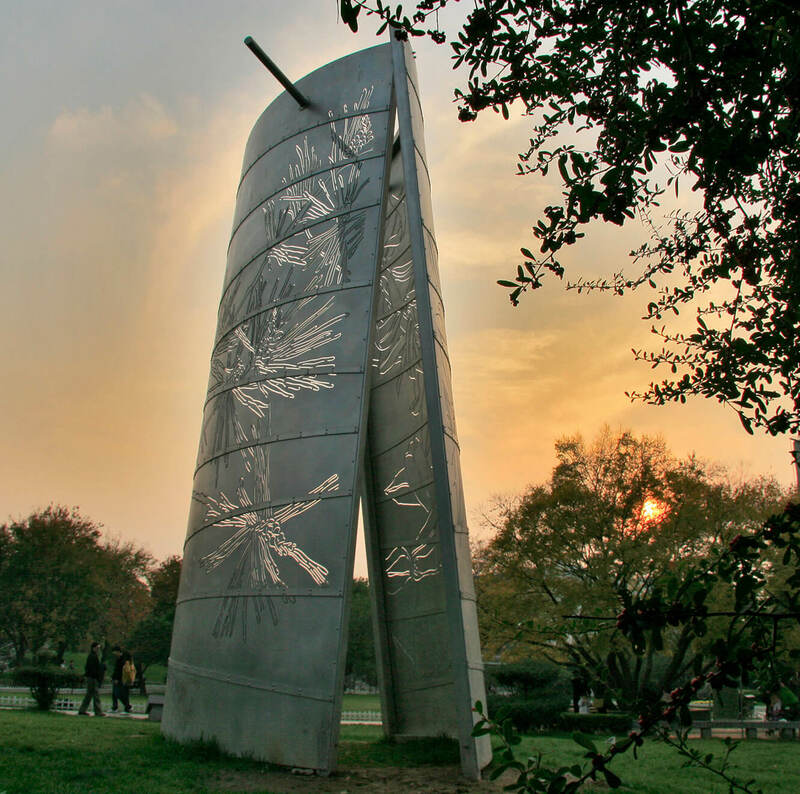 As an introduction to collective artwork projects, the installations can teach inventive ways of recycling and an understanding of and respect for nature. Gaylord S. O’Con, GSEI GroupStructural Engineers Inc. 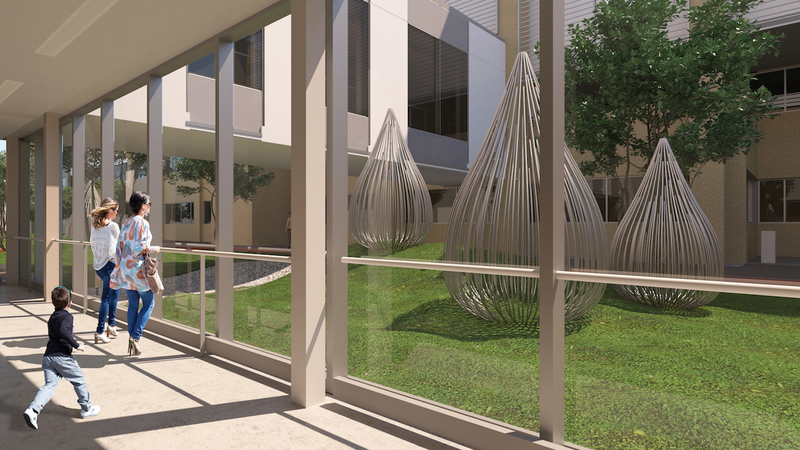 Tall slender tubes flow through an enclosed outdoor space into an exterior entranceway. 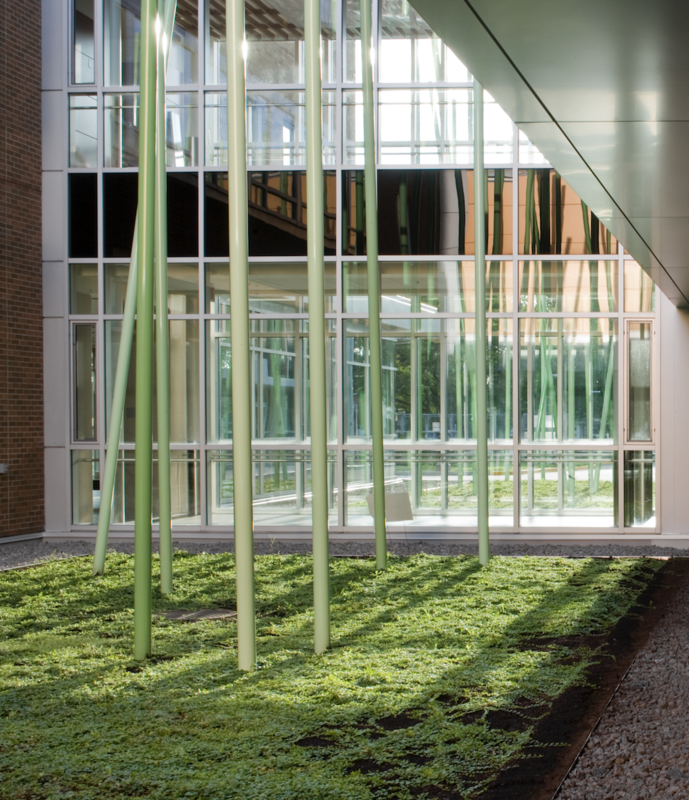 Sited between two hospital pavilions, the zones are separated by a glazed two-storey glass corridor, offering multiple viewpoints onto the installation. 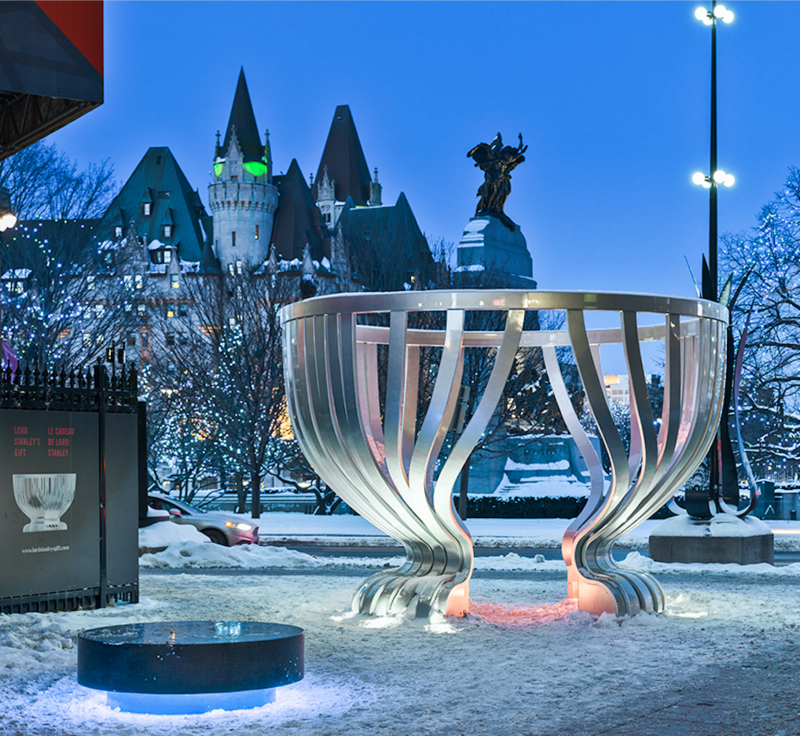 The installation commemorates Berthe Chaurès-Louard, who introduced the concept of cooperation to Quebec (Canada). She founded the province’s first food co-op in Montreal in August 1938 and went on to establish many other cooperative groups over the years. The enlarged plant details cutout of the metal represent the produce cultivated and sold on the Island of Montreal at the time. 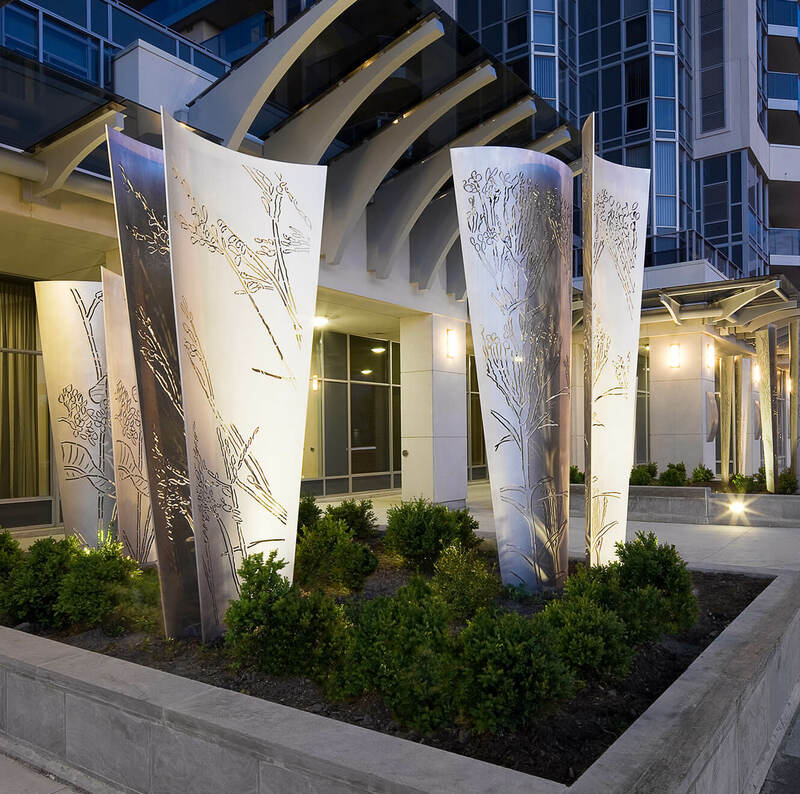 The installation also alludes to the neighbourhood gardens and children’s gardens that sprang up out of a sense of community and spirit of cooperation. 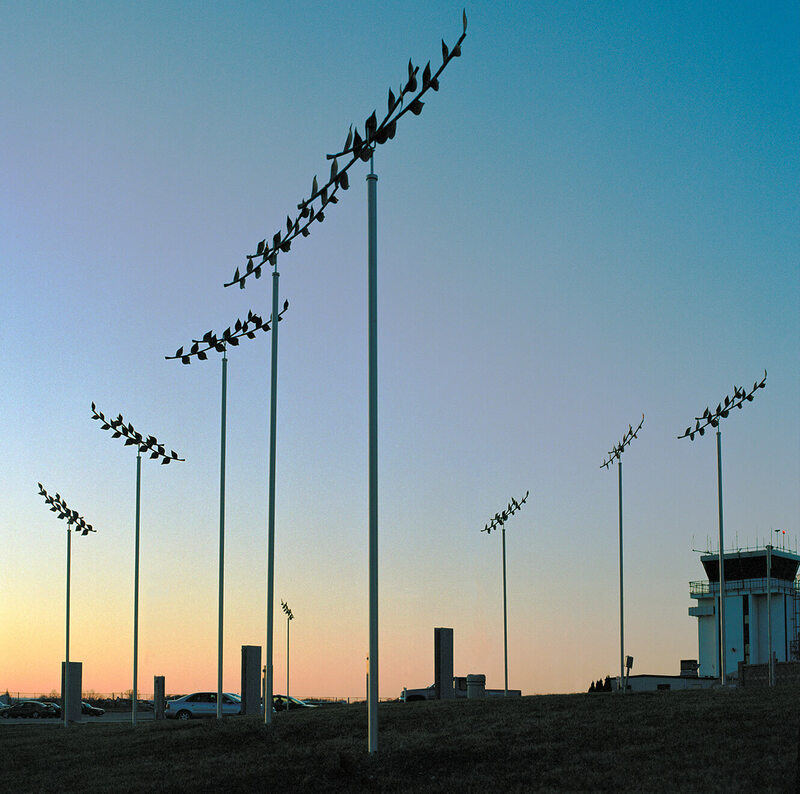 A grouping of mobiles extends across the grassy area in front of the airport building. Their branches of leaves turn slowly with the currents of air, embodying the poetics of wind and flight. The History Posts were inspired by the story of Mary Weber, who learned to fly here at age 20 and became the fifth woman in Canada to earn a pilot’s licence. 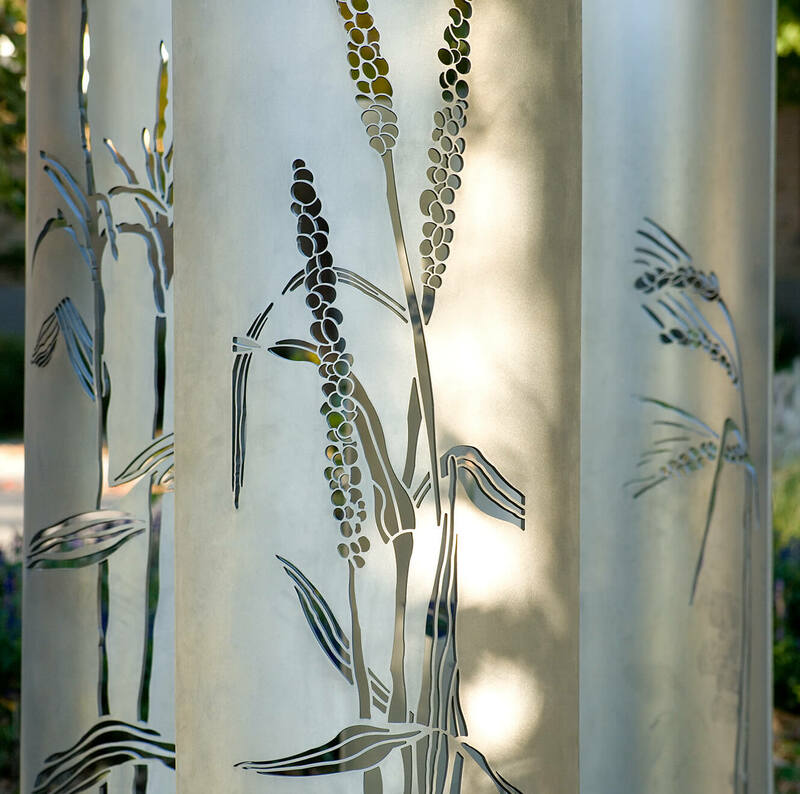 Each of the illuminated columns is silk-screened with an archival photograph accompanied by a descriptive text. They line the walkway to the terminal entrance, offering travellers a glimpse of the airport’s milestones since its beginnings in 1929. 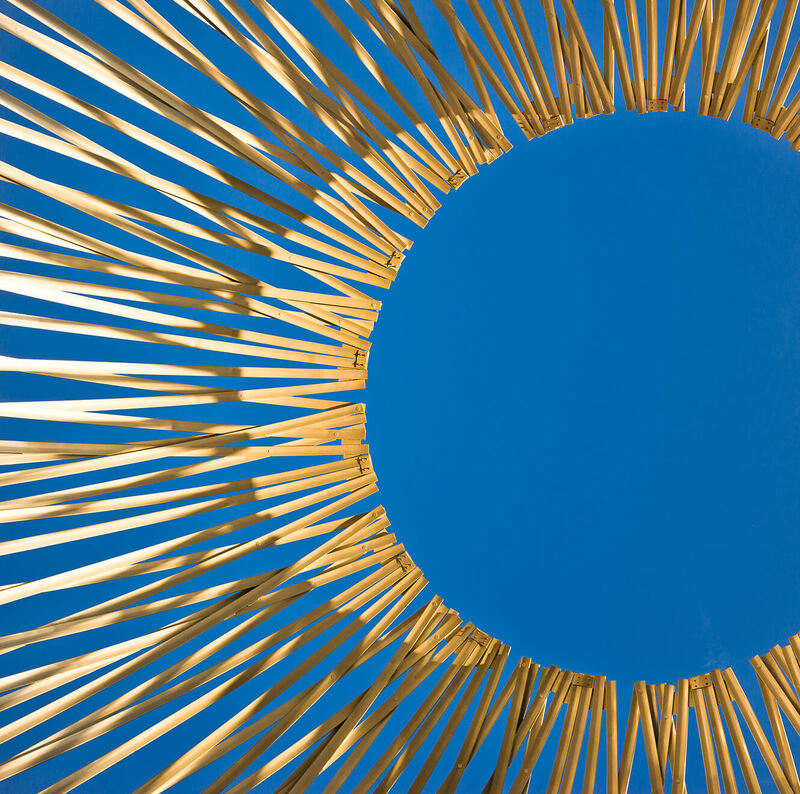 The sculpture speaks of our coexistence with nature, expressed through dichotomies of the built and the natural, curved and straight lines, inert and living things, contemporary and traditional art. The abandoned schoolhouse site was chosen for its location and history. Midway between two depopulated farming communities, the empty building and its grounds are used by local residents for meetings and celebrations. 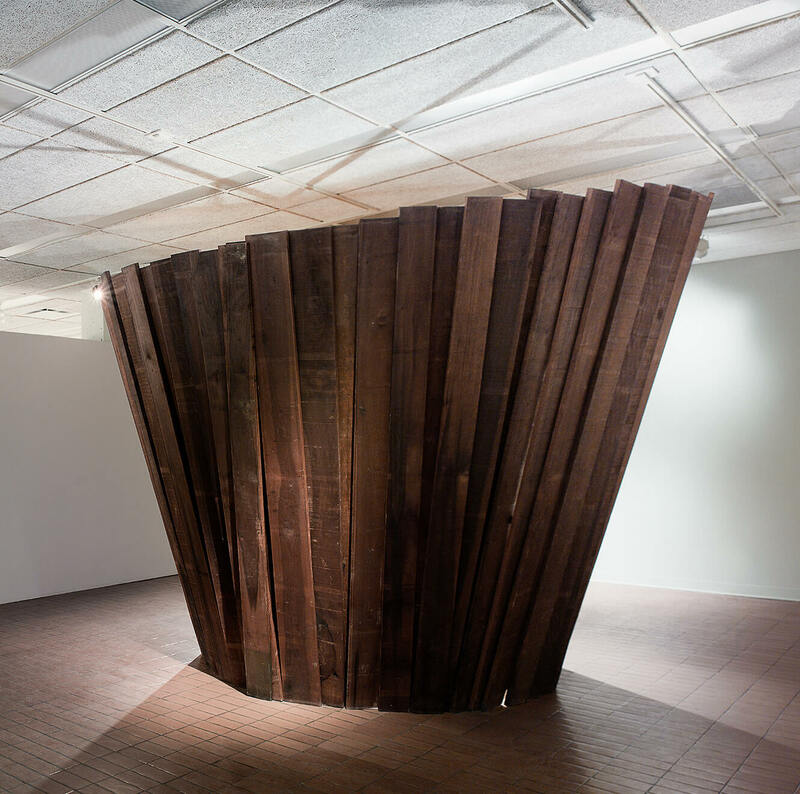 The installation’s form suggests a gathering place. 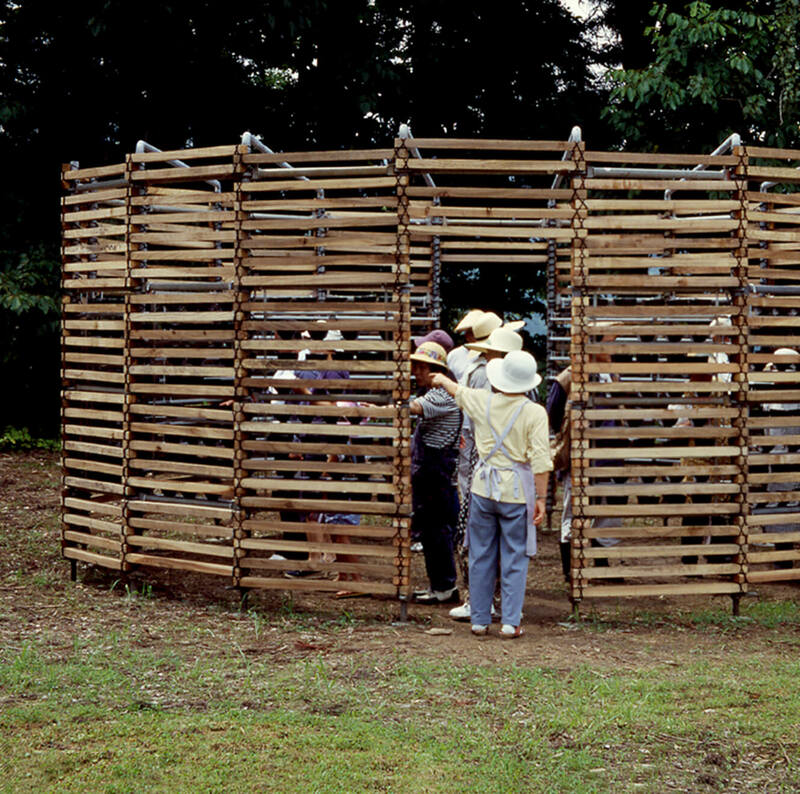 It references the juncture of the two small communities, and a kura – a Japanese storehouse for rice. 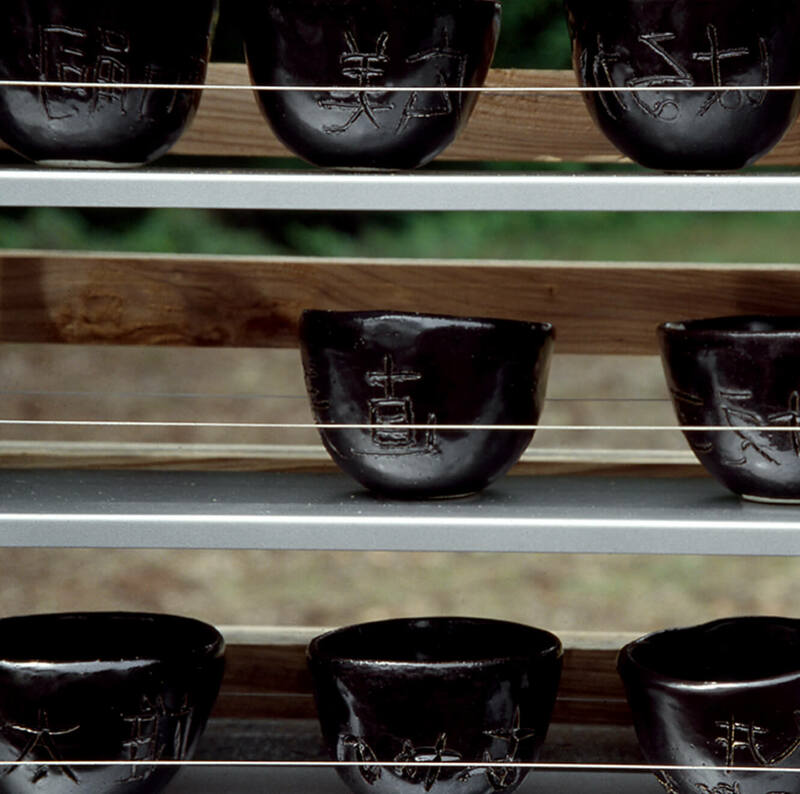 Hundreds of small, black-glazed ceramic bowls line the inner walls of the cedar structure. Similar in size and shape to a rice bowl held cupped in the hands, each is engraved with the name of a resident or family member. In the context of the triennial, I worked with a team of ceramic students and gave workshops to residents to produce the bowls. The local residents engraved each bowl with their name or family member. 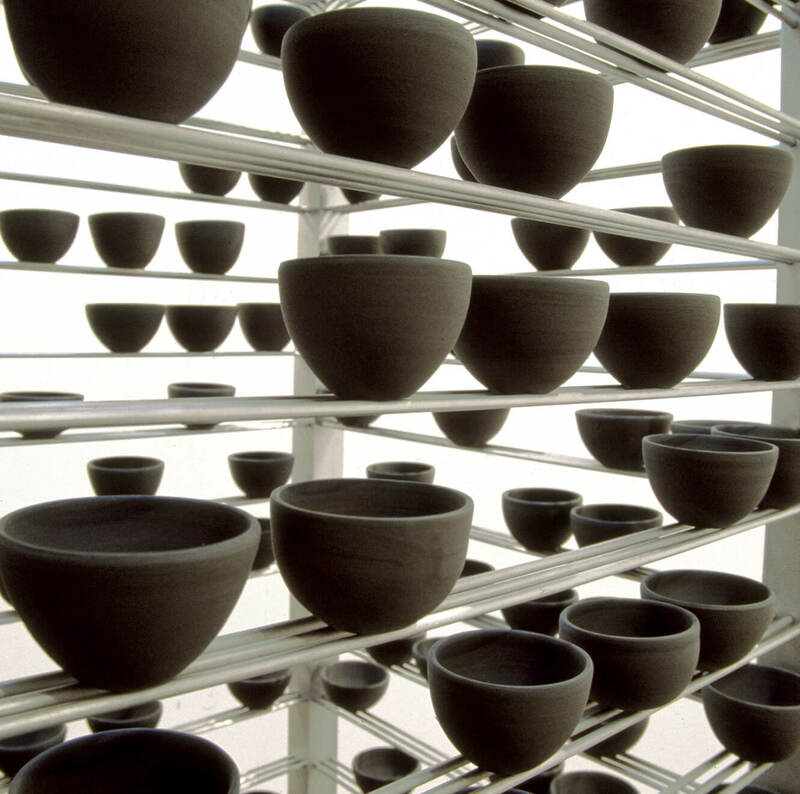 The black glazed bowls are deposited inside the structure, a storehouse of names. Inspired by the lantern-festooned floats of Kyoto’s Gion Matsuri (festival), the sculpture comprises some two hundred bowls perched around an open structure. The precarious equilibrium of the bowls, poised on slender rods, speaks to the nature of fragility and, ultimately, to our own impermanence. 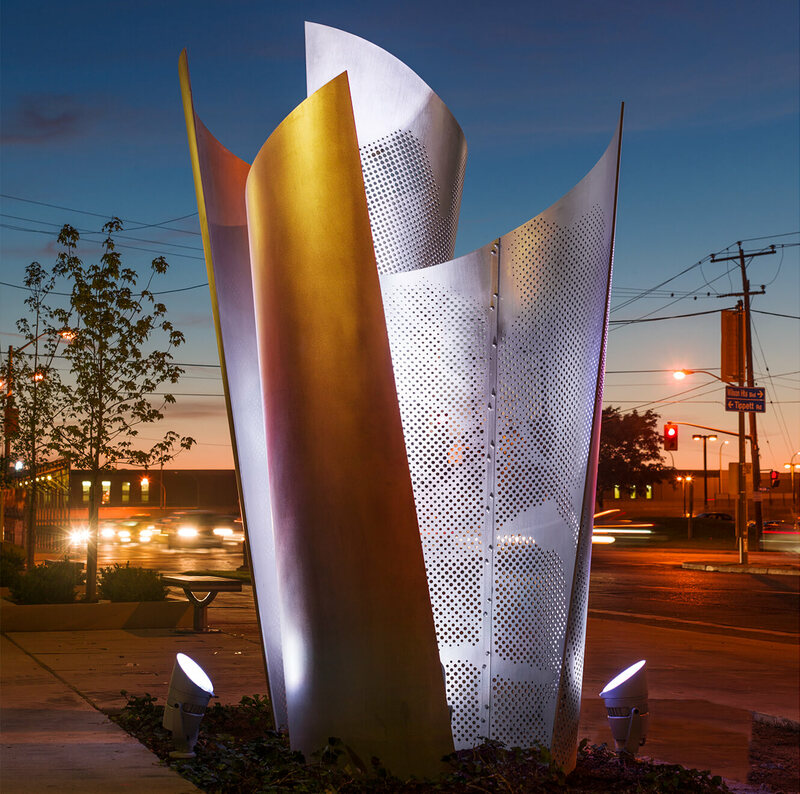 The installation is set on the grounds of a community centre in the economically disadvantaged, multicultural Jane-Finch neighbourhood. 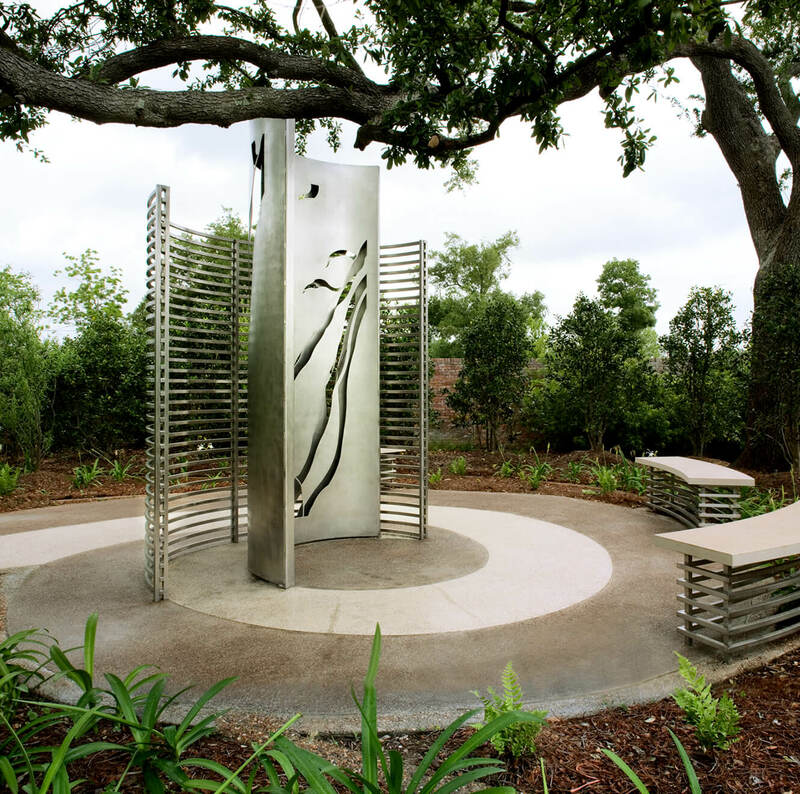 The themes were defined by the commissioning committee in consultation with the community; one of the goals was to create an outdoor meeting place. A wide stone bench traces an 18m (60-foot) long arc, the circular movement reinforced by a stand of light columns and birch trees. Narrow lengths of granite alternating with wide bands of river stones form a footpath into the circle. 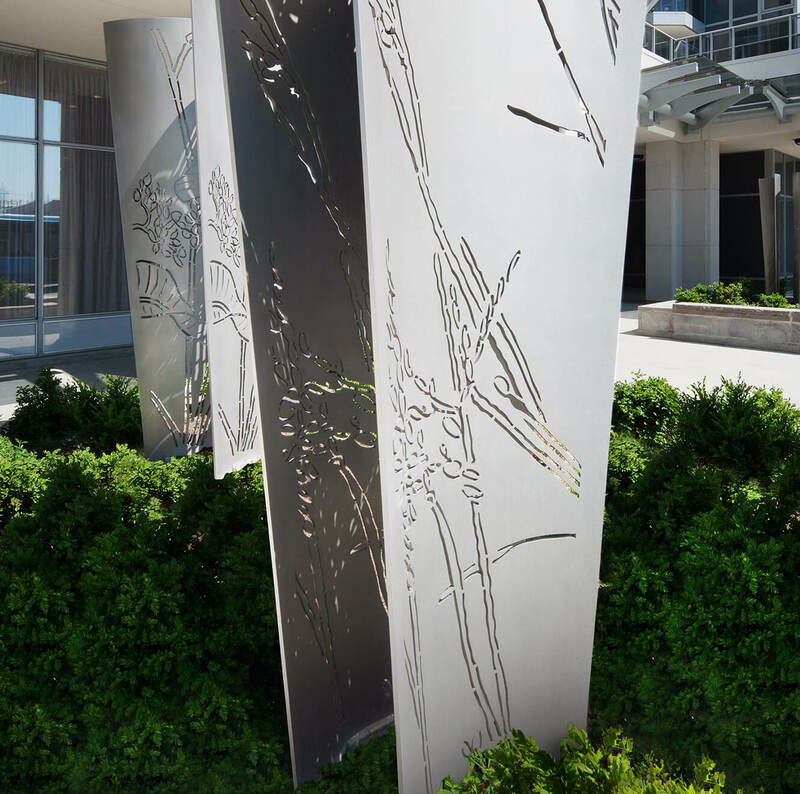 Each granite piece contains a thin channel that collects rain or snow; on dry days, the dark lines formed by the shadowed incisions evoke the ephemeral liquid lines. 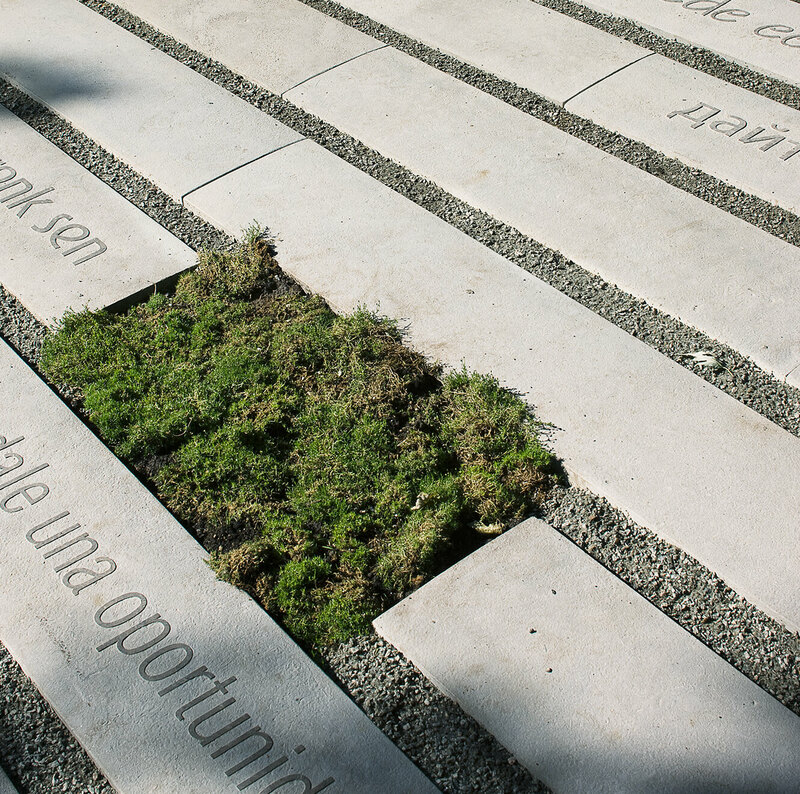 Small boulders engraved with words such as heritage, trust, friendship and gathering are scattered within the circle and extend outwards through the adjacent wooded grounds. 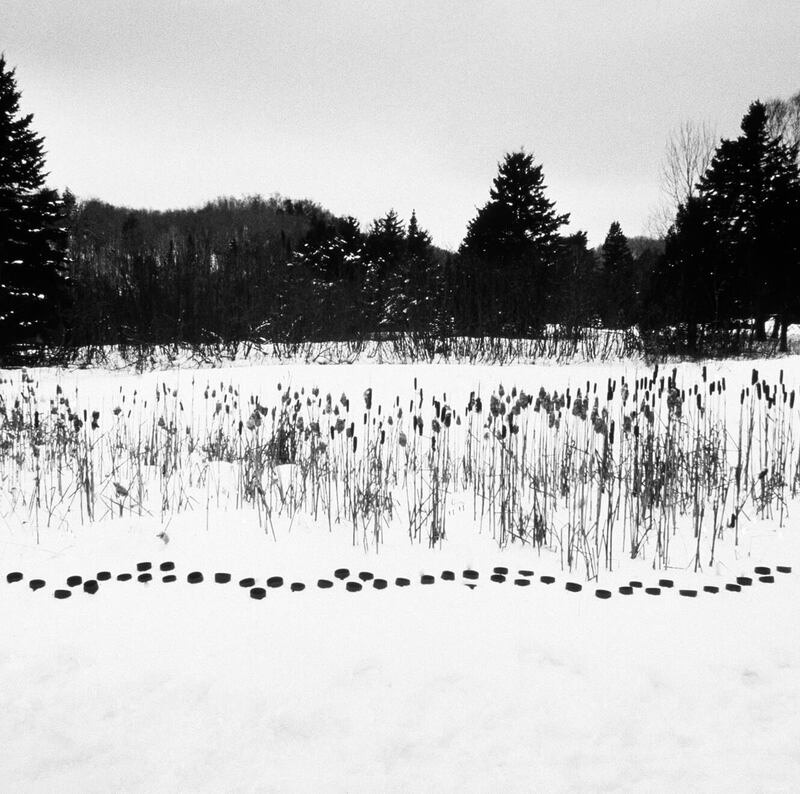 In winter 2001, I photographed a number of my black ceramic bowls in the white snow of the Laurentian countryside. 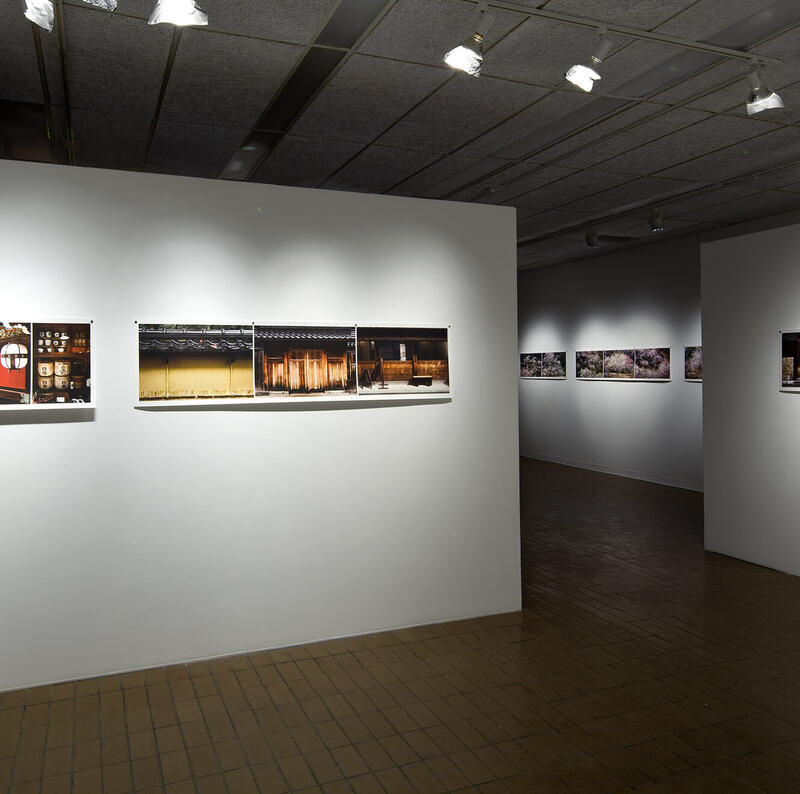 From this, a series of images was printed in large format for an exhibition in Japan, bringing my interventions in the Quebec winter landscape into a very hot and humid Japanese summer. 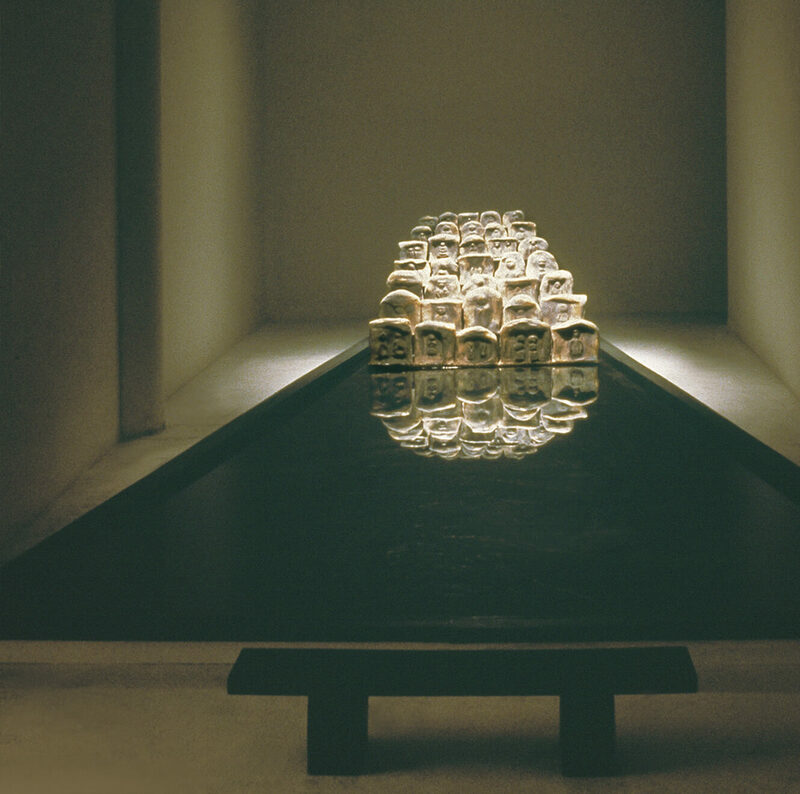 A tea master, after visiting the exhibition, likened the experience of viewing these images to the practice of putting ice cubes in tea during the summer months. 76 x 127 cm / 30" x 50"
Inspired by the bronze temple bells of Japan, the sculpture’s dimensions are scaled to the human body. Its exterior is heavily layered with oil and pigment, while the hollow interior is painted matte black. 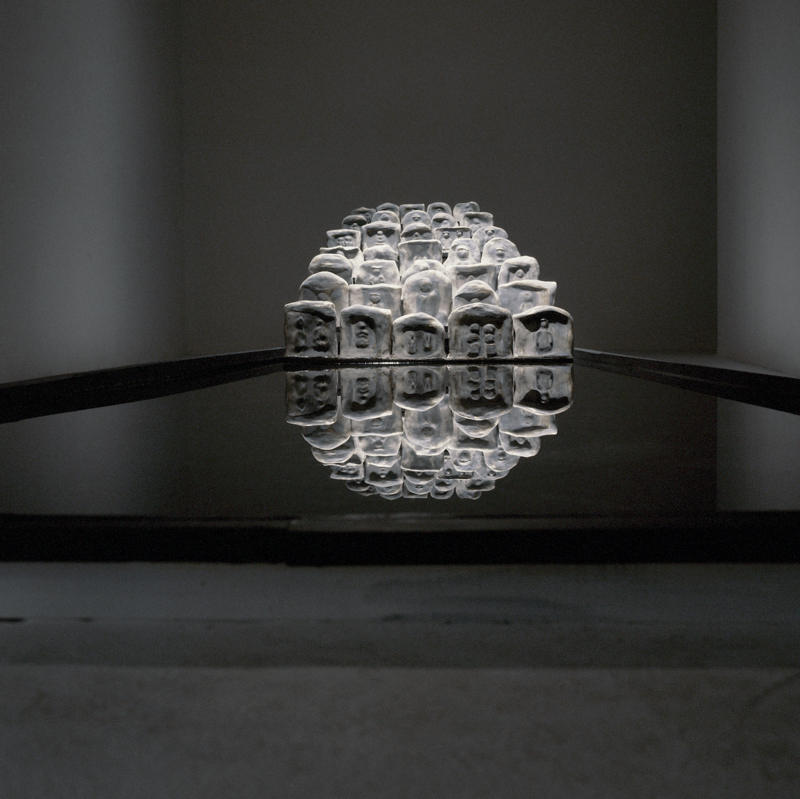 The sculpture was produced during a residency at Est -Nord-Est, Saint-Jean-Port-Jolie. 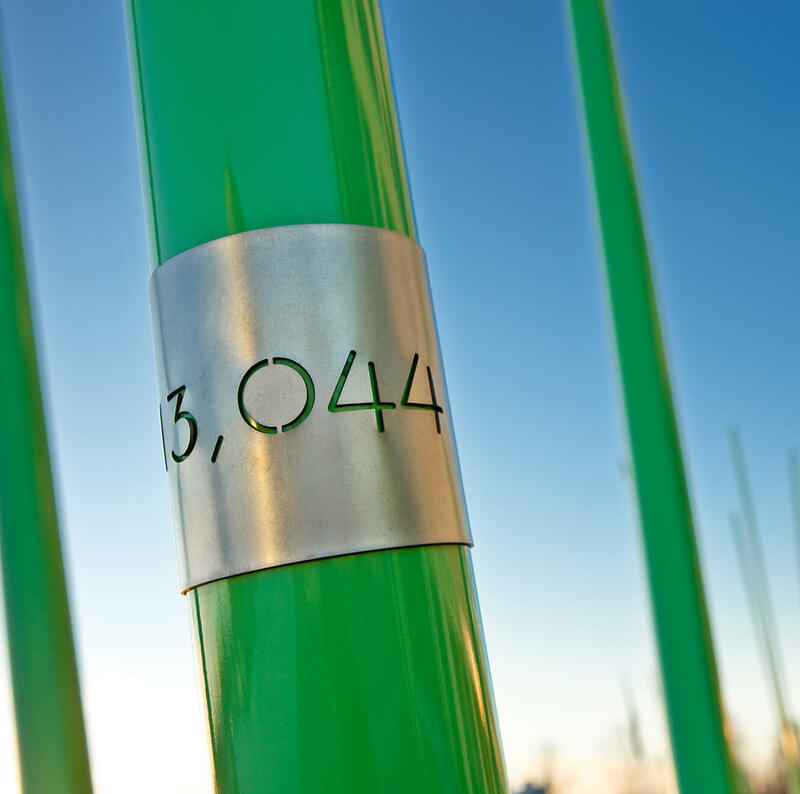 This commission for an outdoor sculpture park was conceived for a grassy area located between a bicycle path and a waterway. 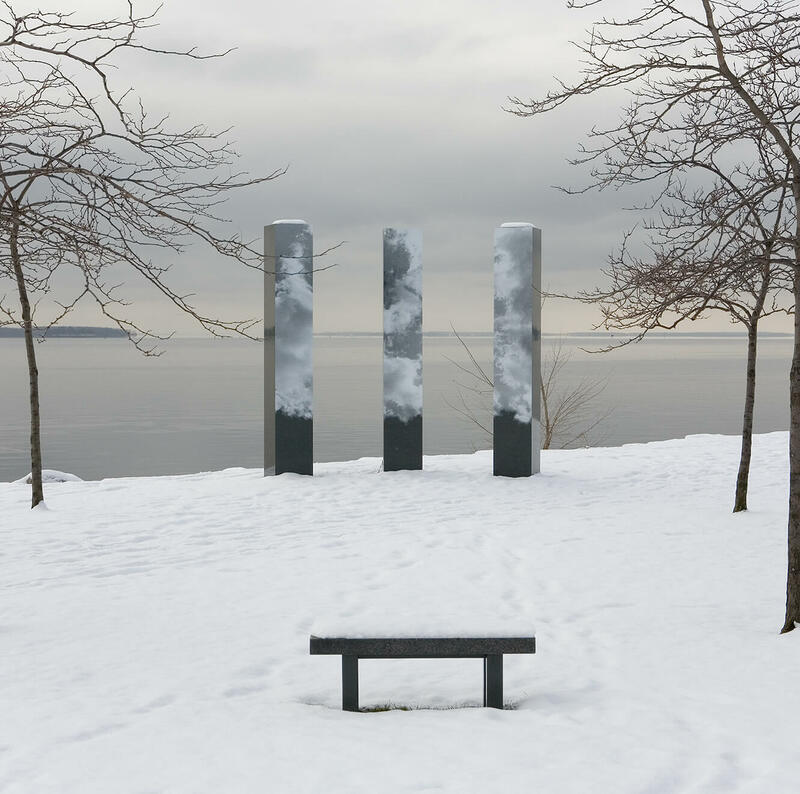 Three columns silk-screened with a photographic image of clouds are aligned in an arc, positioned between two land masses to reveal the water and sky stretching into infinity. Viewed from a bench centred some 30 feet in front of it, the installation blurs the lines between the existing and the imagined. 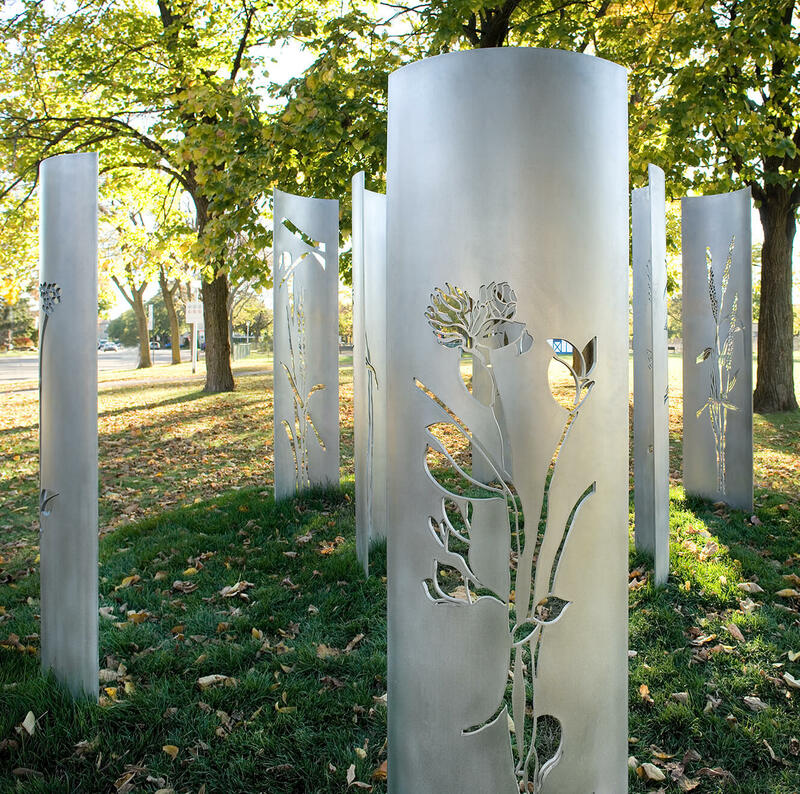 This peace monument was created for Montreal’s 350th anniversary celebrations. 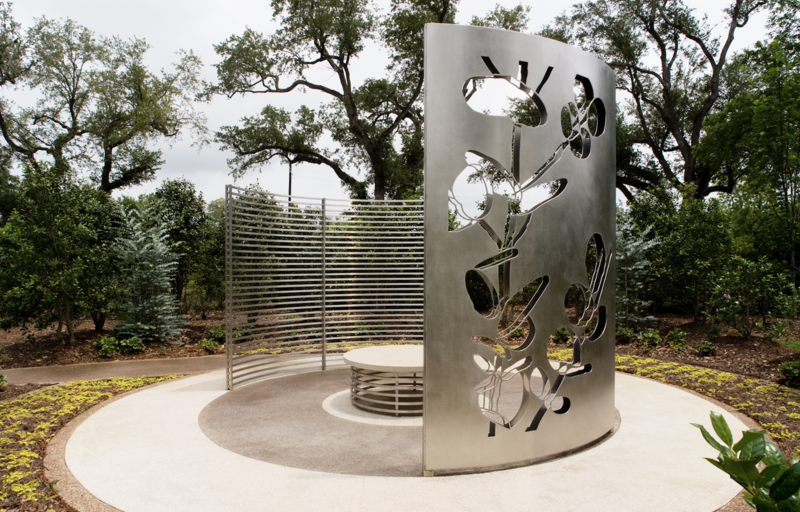 Two central stainless steel “doors” rise out of the ground through a granite spiral, opening onto a garden. 12,700 war toys, donated by children as a gesture for peace, are buried underneath. 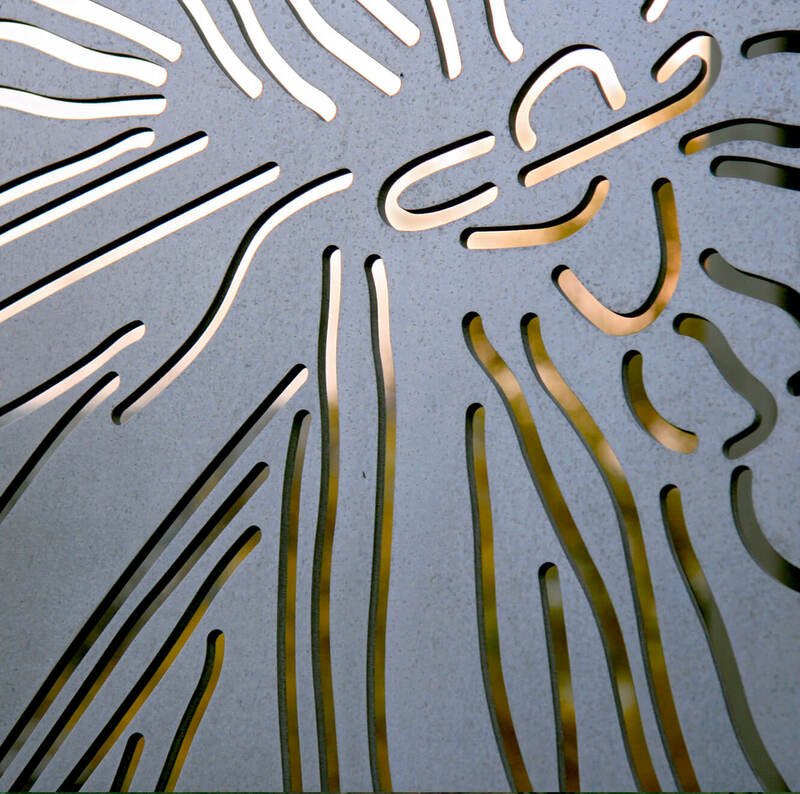 Some have their silhouettes cut out in brass plates, inlaid in the spiral and left to be overgrown with weeds. 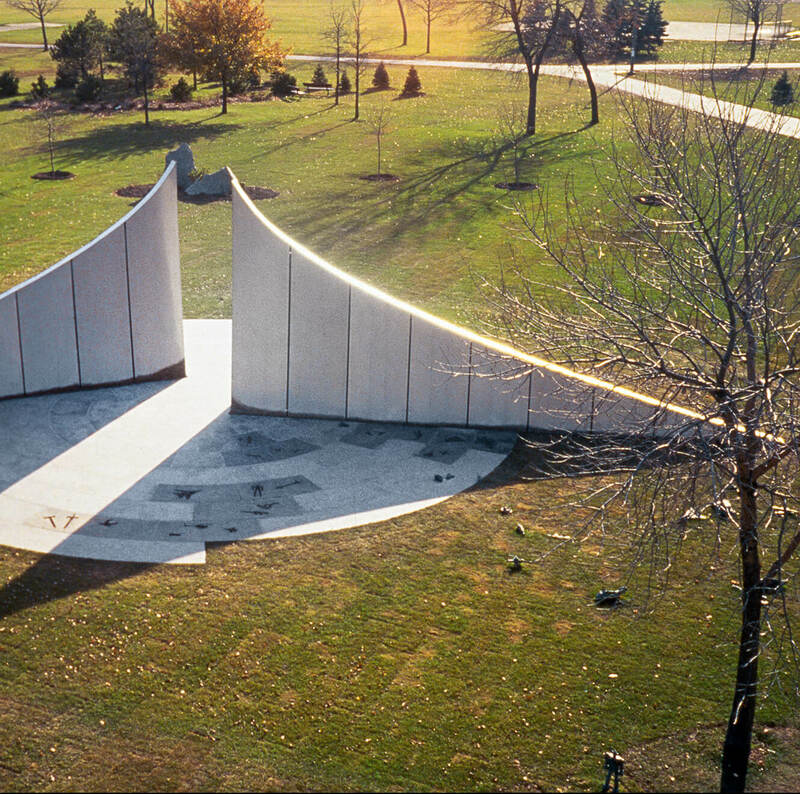 Thirty are cast in bronze, scattered across the spiral base and adjacent lawn. A central axis links the garden on one side with three benches on the other, where a semicircular planting of bushes creates an intimate alcove. Caesura is dedicated to all the individuals engaged in the pursuit of peace. Thirty-five “stones” are arranged in seven rows on a structure graduating in height. Inspired by a sekibutsu-gun (stone/Buddha/group) I had photographed in the Daitoku-ji temple grounds in Kyoto, Japan, these “stones” are made of clay. The vague images of human forms sculpted in relief are rubbed with grey/green powders and highlighted in gold. Placed at the end of a 25’ (7,6m) long black reflecting pool, the water’s reflection completes the circular image. 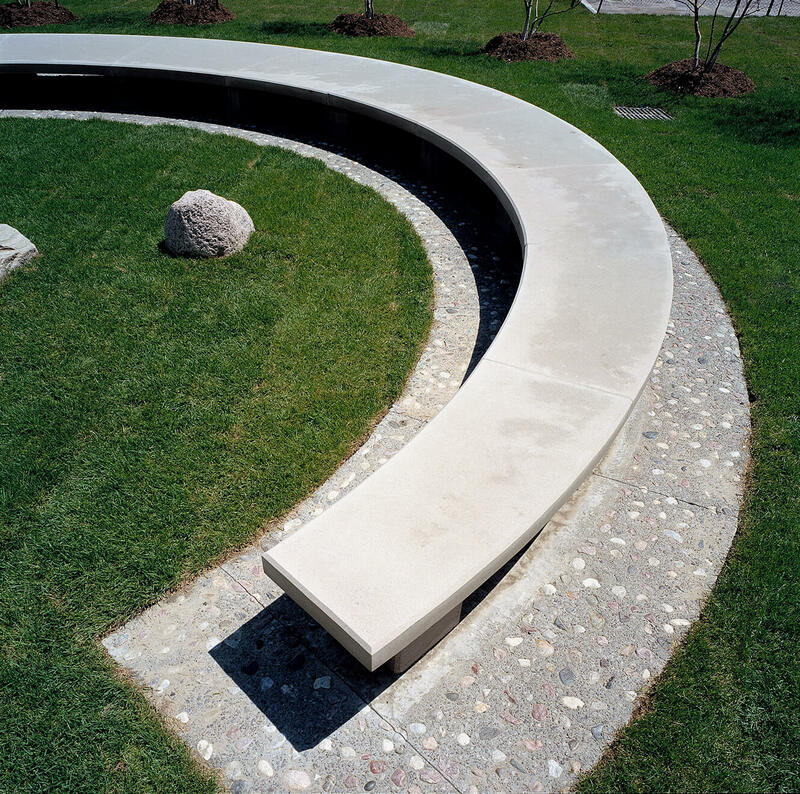 A small bench centred in front offers the optimum place for viewing.